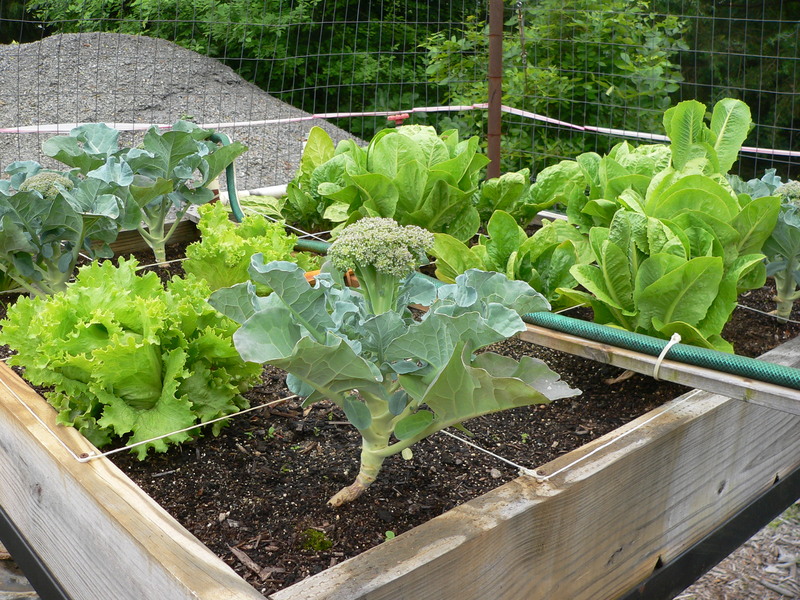 We had some really hard rain off and on yesterday, with more this morning, so I was a bit worried about what I might find in our raised bed square foot garden. We built 6 ‘boxes’ that are each 4 feet by 4 feet, installing them on metal supports about my chest high. 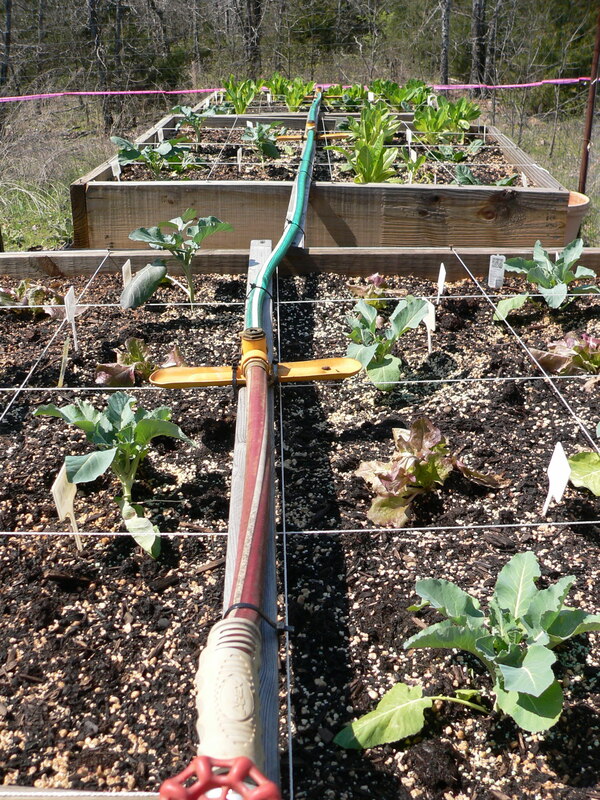 This enables me to enjoy adding soil, planting, weeding, and harvesting without having to get down on my hands and knees, or bend over double. You can see 5 of the 6 boxes in the photo above. 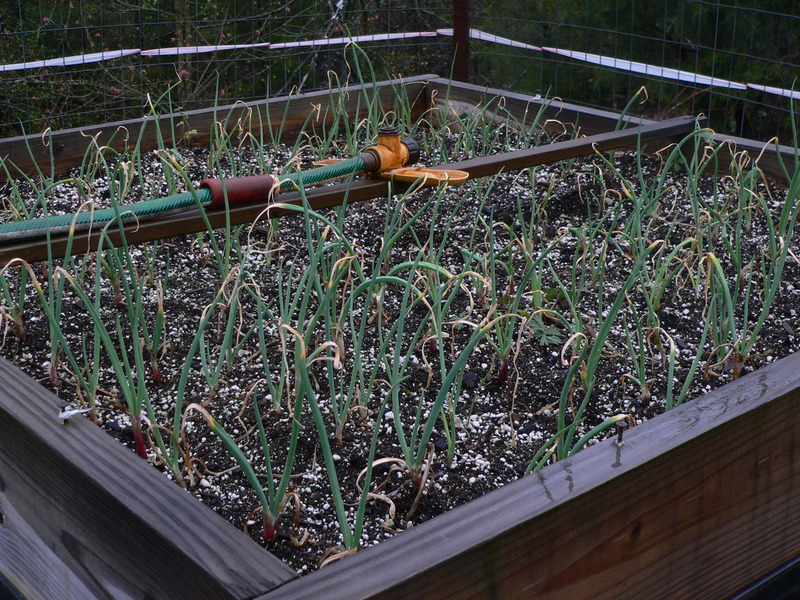 I planted one whole box with sweet red onion sets. I’ll leave these alone until harvest, other than weeding and maybe thinning out as the bulbs grow. 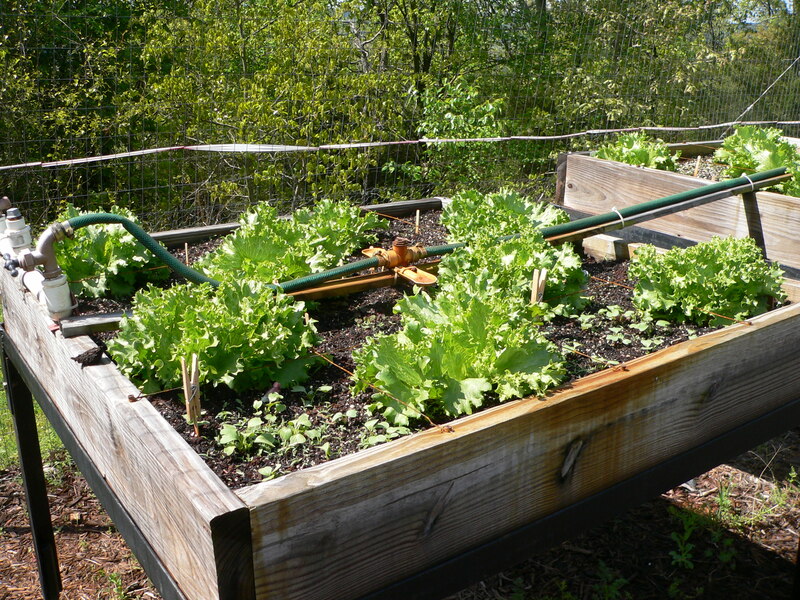 Here is some of the lettuce plants and more radishes. 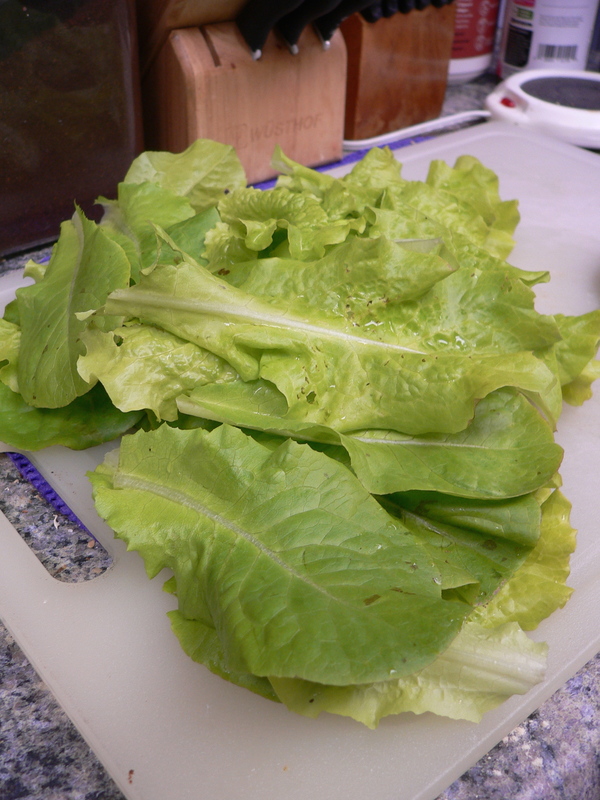 I’ll start harvesting some lettuce leaves tomorrow. This is what I call the NOOK planter, since it is cradled by the back of the house and the end of the back porch. 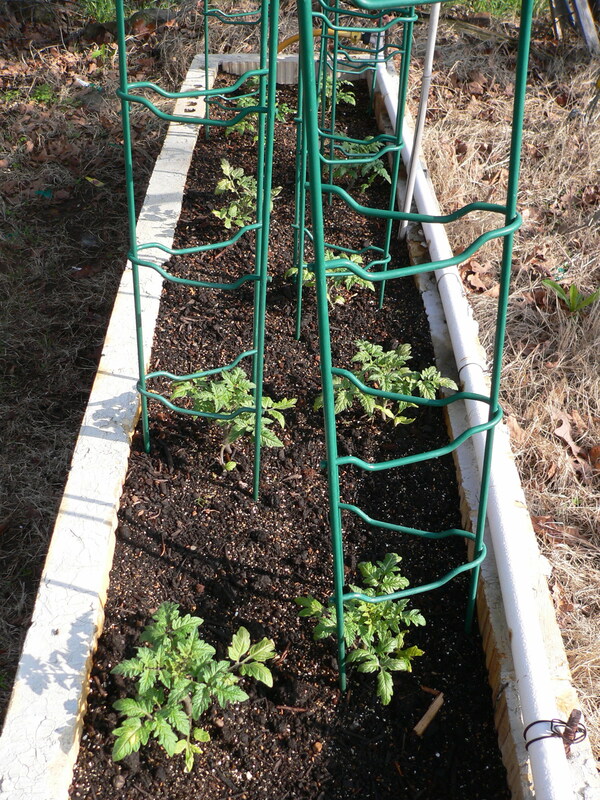 The tomato plants are quite sheltered from the wind here, plus get more shade. 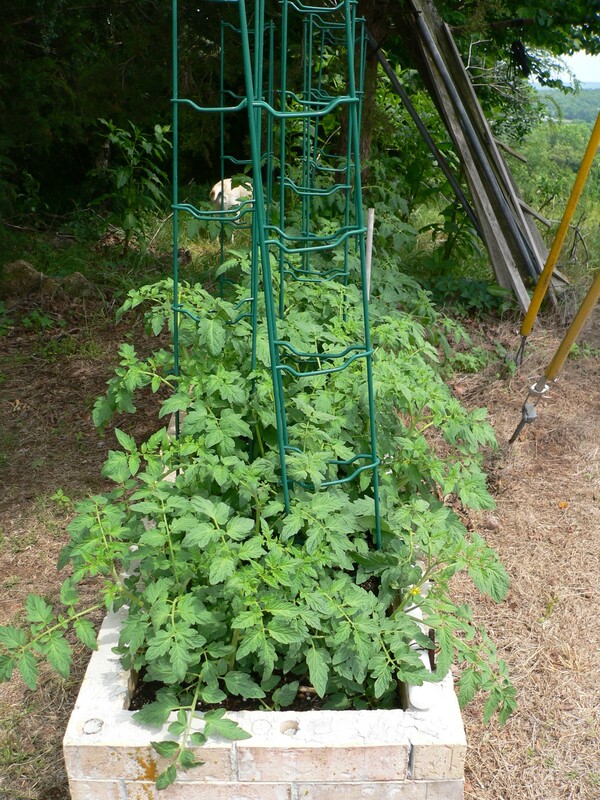 And this is the second tomato planter. It is more exposed than the other. 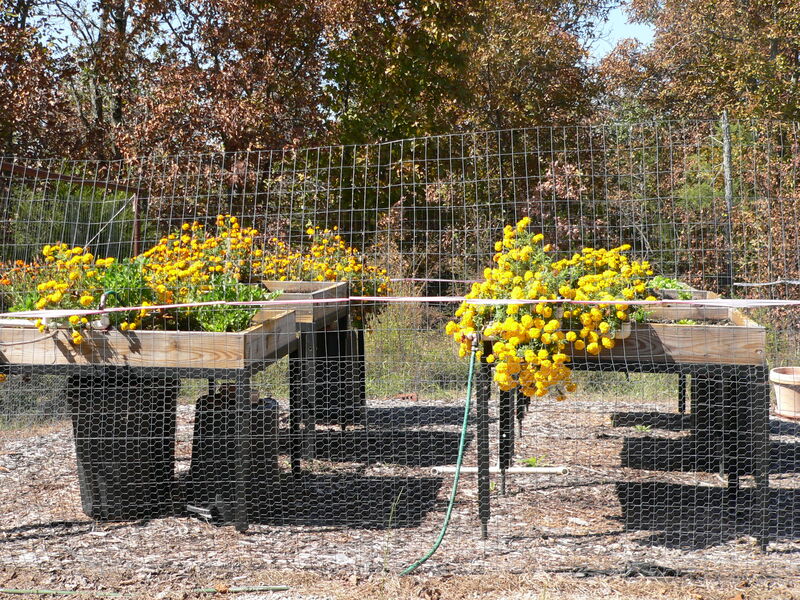 It seems to depend on the year whether the tomatoes produce better in the sun and wind or relative protection and shade. I’m finally recovered from my 2nd Shingles vaccination (except for a sore arm) so I headed out to the greenhouse, armed with wasp/hornet spray. I shot down 12 wasps (I LOVE being able to do that before they sting ME) and then got down to the business of starting over trying to get some spinach plants going. 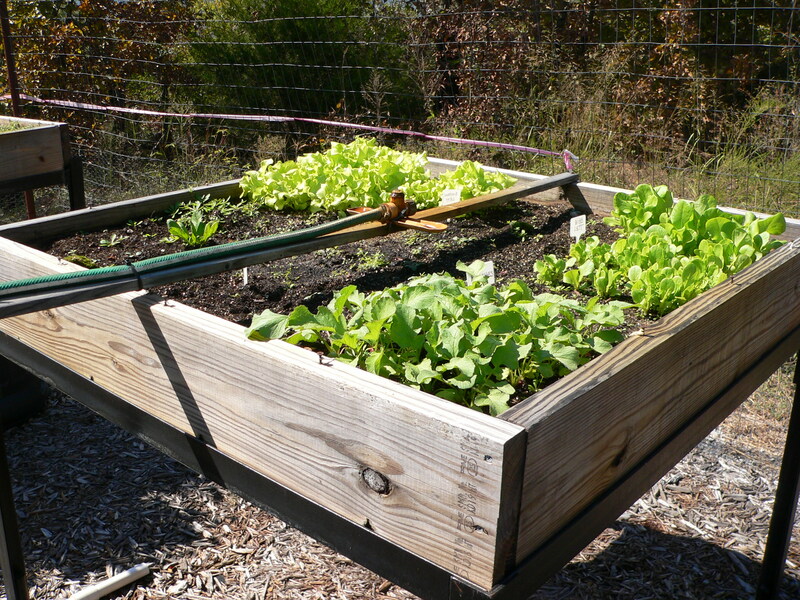 When I finished that, I went out to our garden to plant radishes. 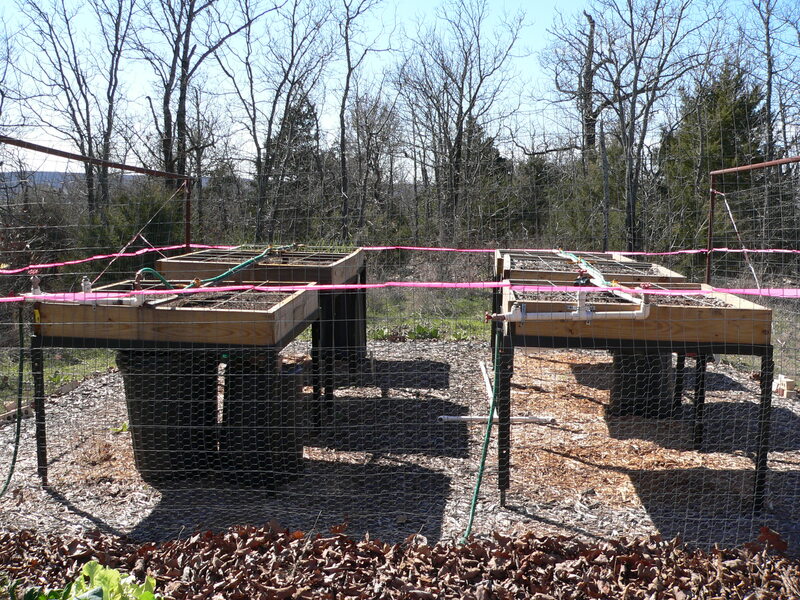 (They go directly into the ground, rather than having to be started in the greenhouse and then moved.) I ran out of markers for the squares, so put some clothes pins on some of the Popsicle sticks and named them “radish” markers until I can make some. I just came in from watering and cleaning up out there. There isn’t anything that would make good pictures, other than the broccoli, lettuce, and red onions I’ve already shown you, but hopefully there will be some sprouts soon. I really hope I can get some spinach out there. Today was a stellar day. It’s sunshine-y and 56 degrees F., though with only a slight breeze feels much warmer. It was perfect. 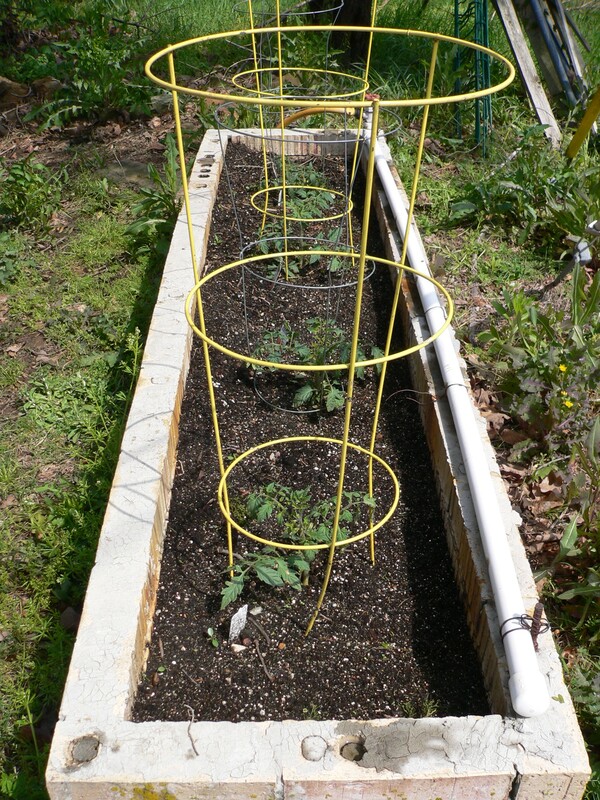 I’m hoping to get tomato plants in the ground by the end of next week. I hope the weather is treating you well, too. 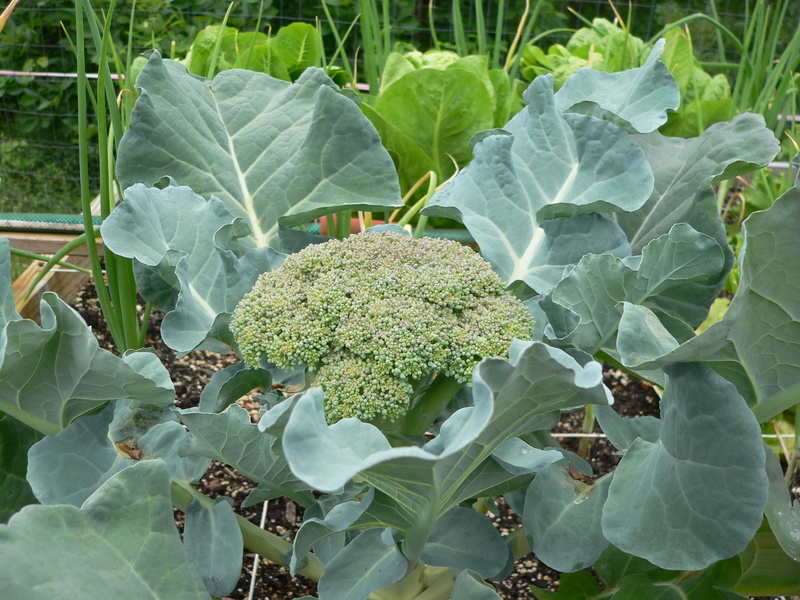 Can you see the teeny, tiny broccoli spear in the center? Woo HOOO! Due to my bad reaction to the 2nd dose of Shingles vaccine, I haven’t done anything this week in the garden. 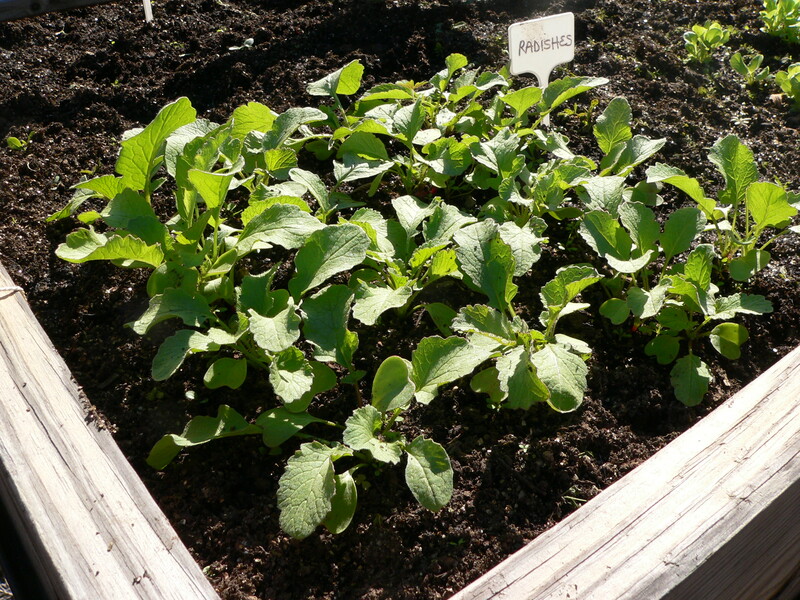 I’m still looking for spinach plants locally, plan to start spinach seeds (AGAIN) in case none show up, and plan to start several squares of radishes. In another week or so, we’ll start tomato plants on the other side of the house! Right now the temperature is dropping pretty precipitously, but this morning it was nice. After we did errands I spent most of the rest of the morning outside. I love working outside, even though I poop out faster than I used to. 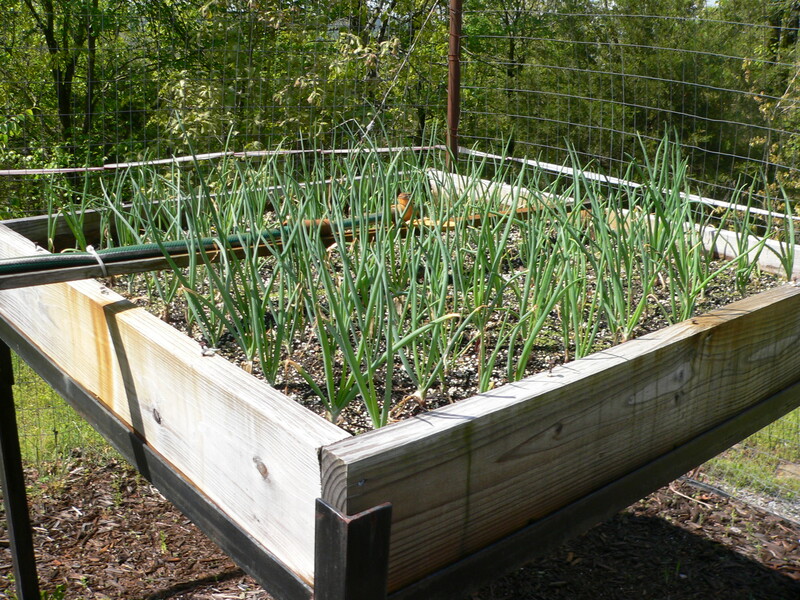 I checked on the onions I planted in my raised bed square foot garden recently. 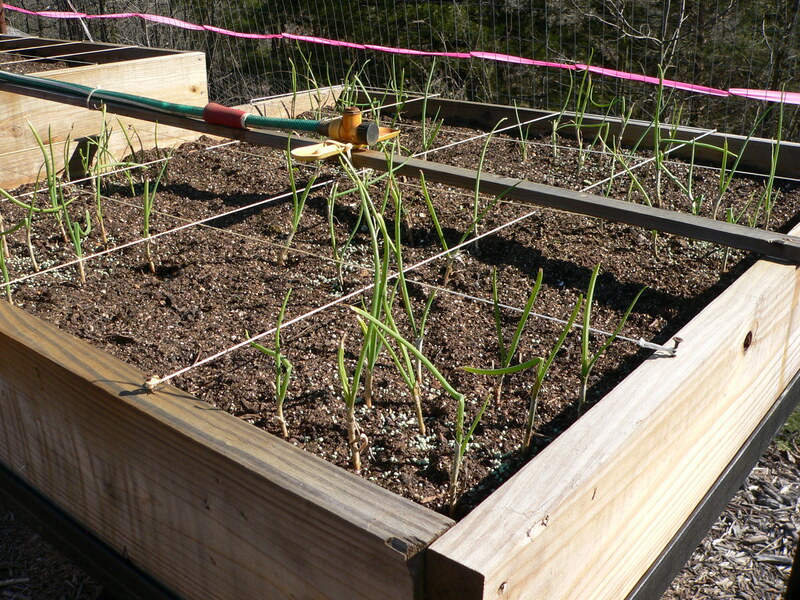 I used one whole 4 foot x 4 foot planter for Sweet Red Onions this time. They’ll stay there until harvest starting in August if all goes well. After I checked on these, I weeded another planter. We have six in all. 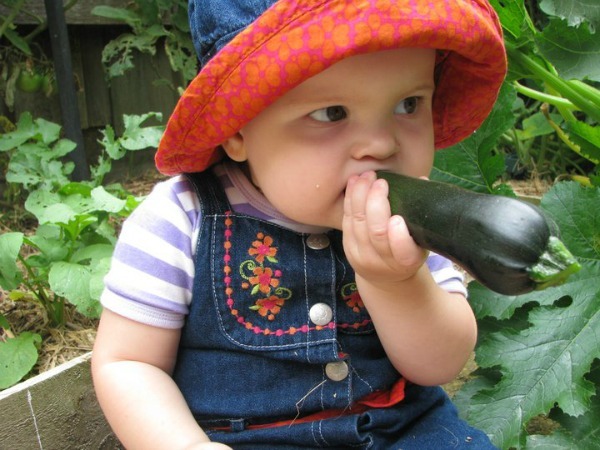 Then I checked on my seeds in the greenhouse. 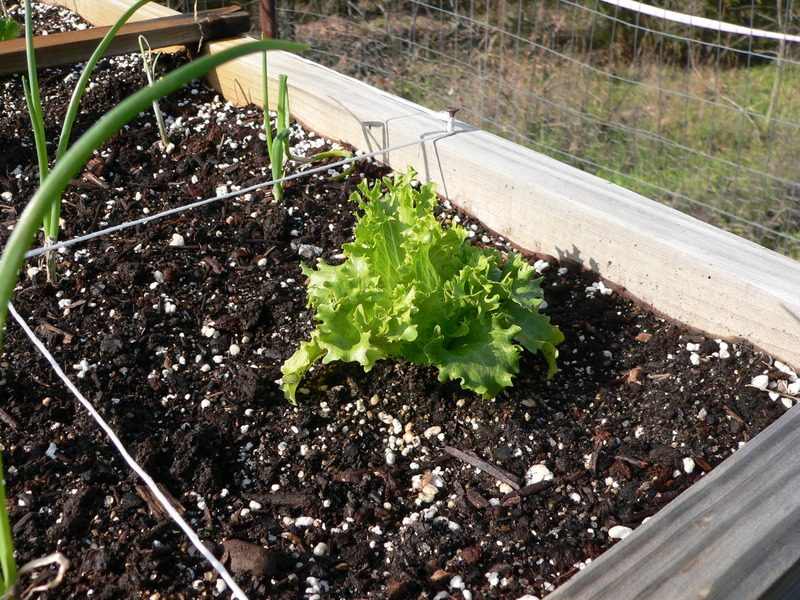 I’m trying to start Iceberg lettuce, Simpson lettuce, and spinach. So far, no sprouts. Since it’s supposed to rain this evening, I spread fertilizer in our planters. I walked around, drinking in the sight of our daffodils that are happily blooming from one end of the front yard to the other. I saw some hyacinths that are blooming, too – a sight for sore eyes. The forecast is for SNOW Sunday and Monday, so I’ll find a king-sized sheet to put over the onions in the hope they’ll come through this hopefully last cold spell of the season. Since Nutrisystem suggests that you NOT wash produce until just before you eat it, and also suggested that produce will last longer in these mesh bags, I took three of the bags out to the garden with me and harvested the produce right into the bags: one for spinach, one for iceberg lettuce, and one for romaine lettuce. 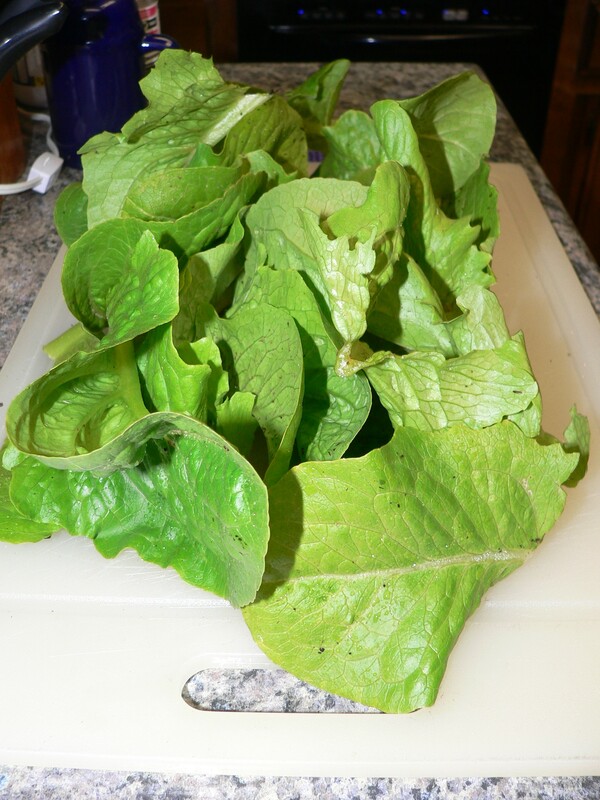 Even though my efforts at growing a garden don’t save us money, the produce we get is so fresh, and it’s so much fun to go out and snip the ingredients for salad from your own garden! I almost didn’t recognize the huge orb in the sky this morning. It’s been at least a week since we’ve seen it, and it was truly a glorious sight. 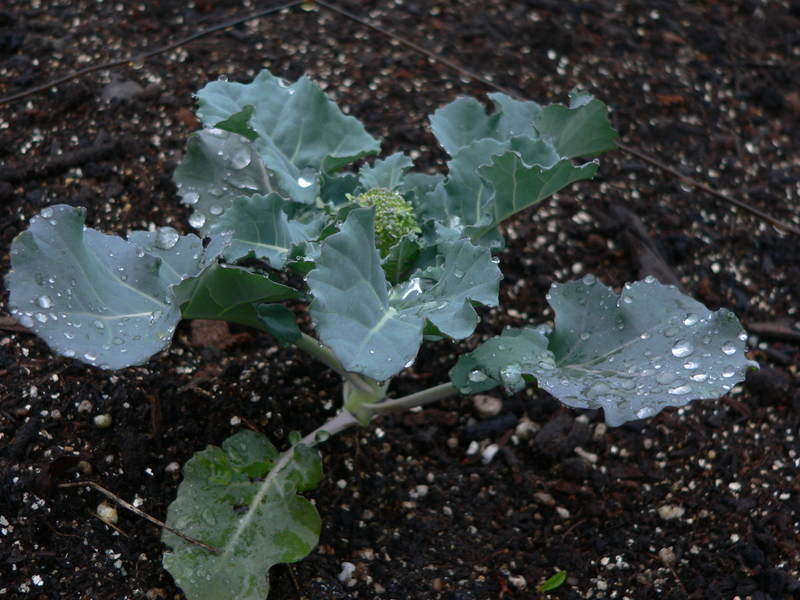 On one of the many ‘walk-the-doggies’ trips I’ve taken today, I took some pictures of my veggie garden. 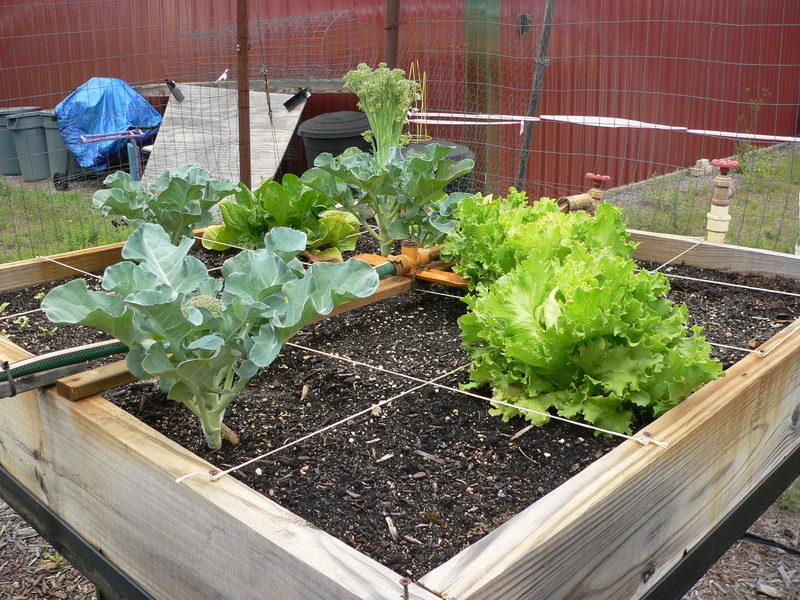 We built our raised bed veggie boxes with drain holes, but we’ve been getting SO much rain relentlessly, I was afraid I would find the boxes washed out and the veggies on the ground. Happily, everything seems to be doing well. 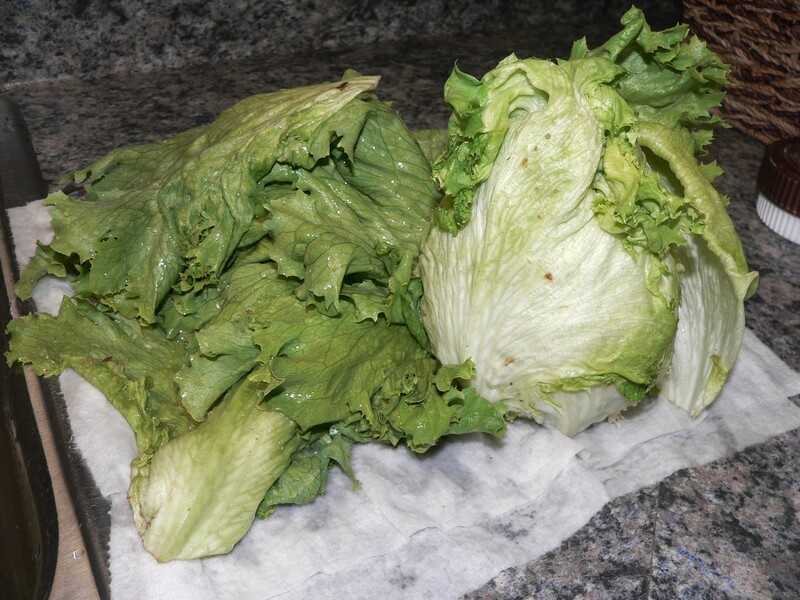 Here is iceberg lettuce and some onions. This is the north side of the garden. 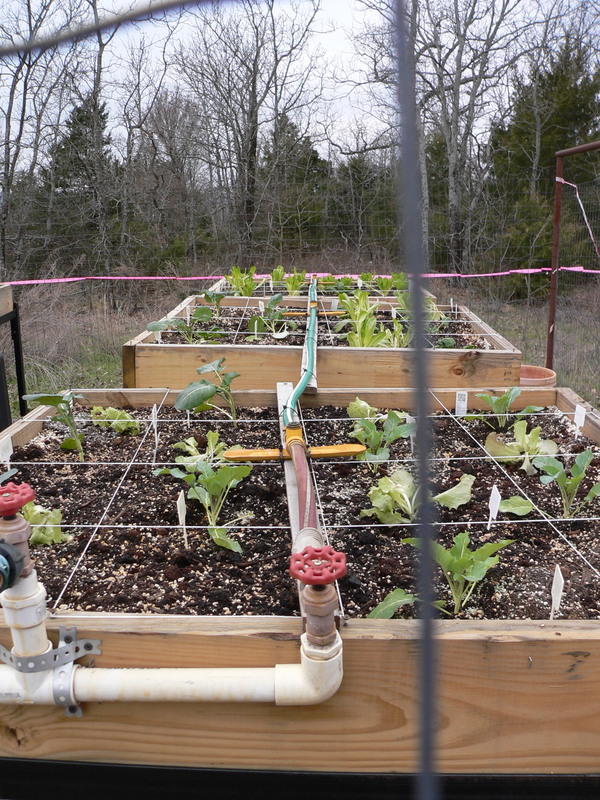 You can see broccoli, spinach, onions, iceburg lettuce, and romaine lettuce. 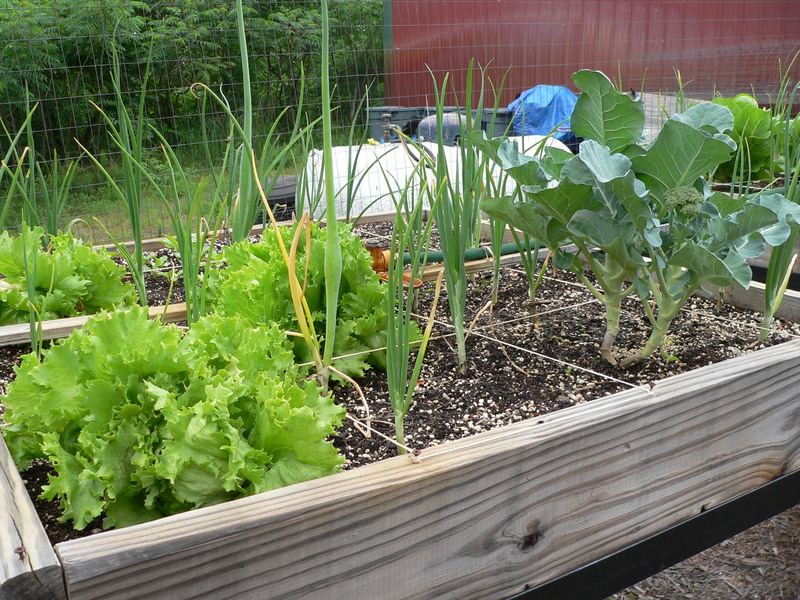 Here’s a better pic of some spinach and some romaine lettuce, plus some onions. This is the south side of the garden. And here is the first group of tomato plants. 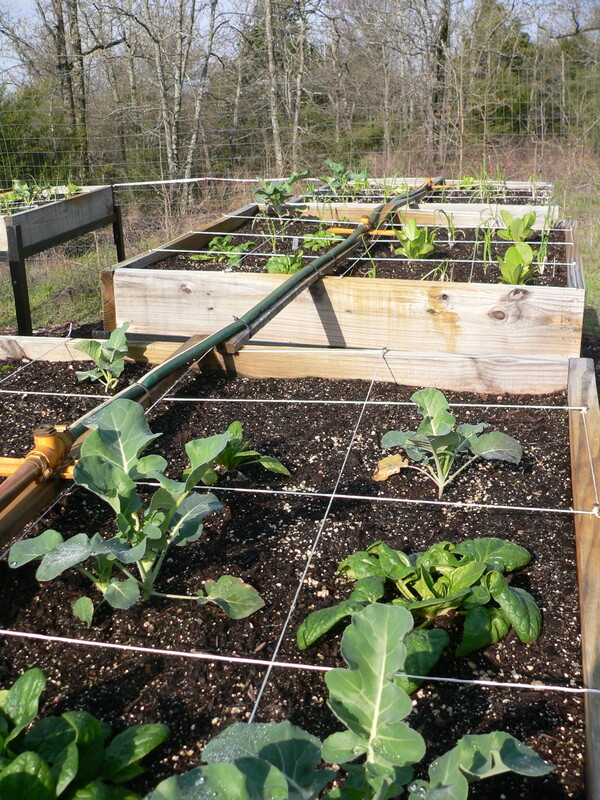 I plan to plant more in a couple of weeks to extend our harvesting season. 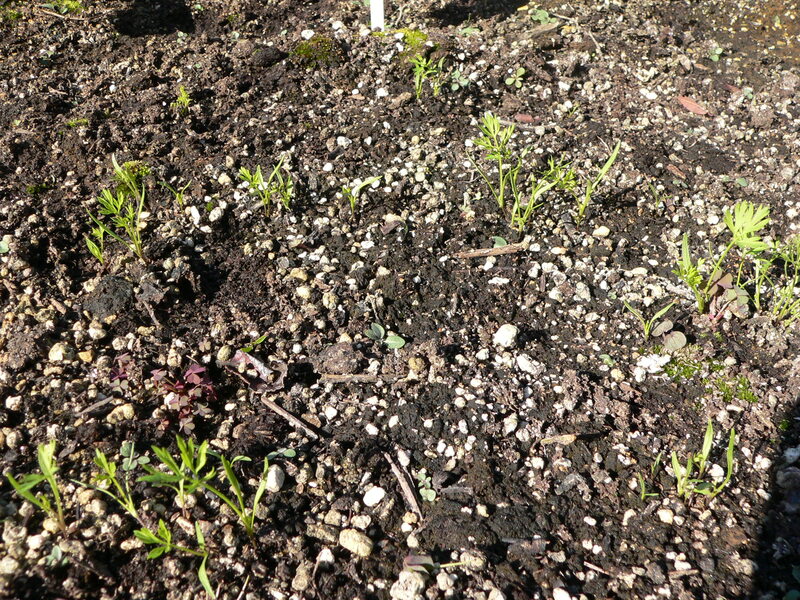 The Spring Garden is Started! I got my plants in this afternoon. This picture gives you an idea of where the garden is in relation to our shop. 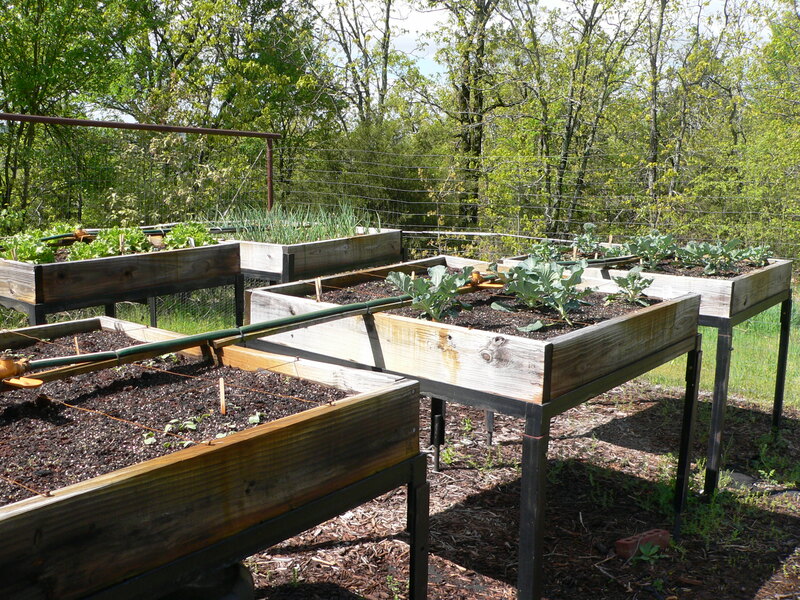 We have six 4’x4’x8″ raised bed boxes in our garden. 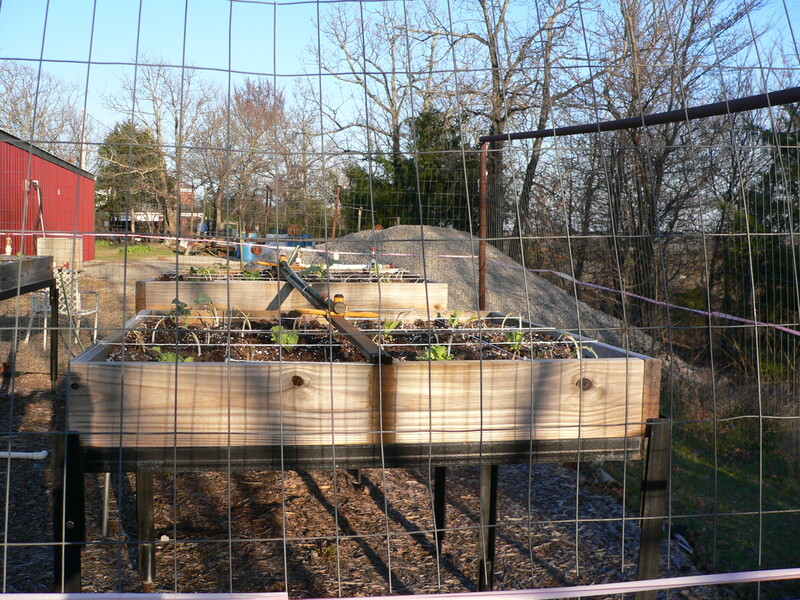 It is surrounded by fencing, with chicken wire also around the bottom. I’ll run some bright surveyor’s tape around the perimeter about chest high and also down each of the guy wires at the corners to warn critters that there is a structure here. 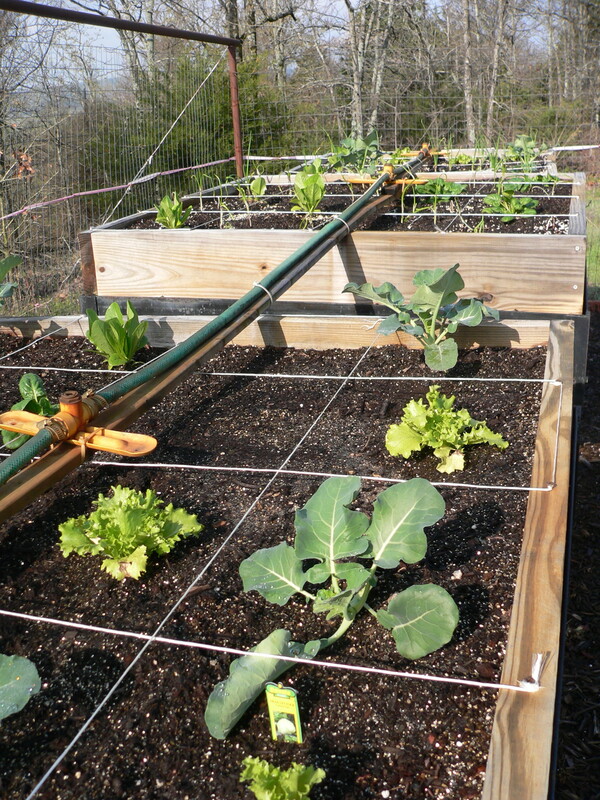 I’m planting fewer things this year, with wider spacing. 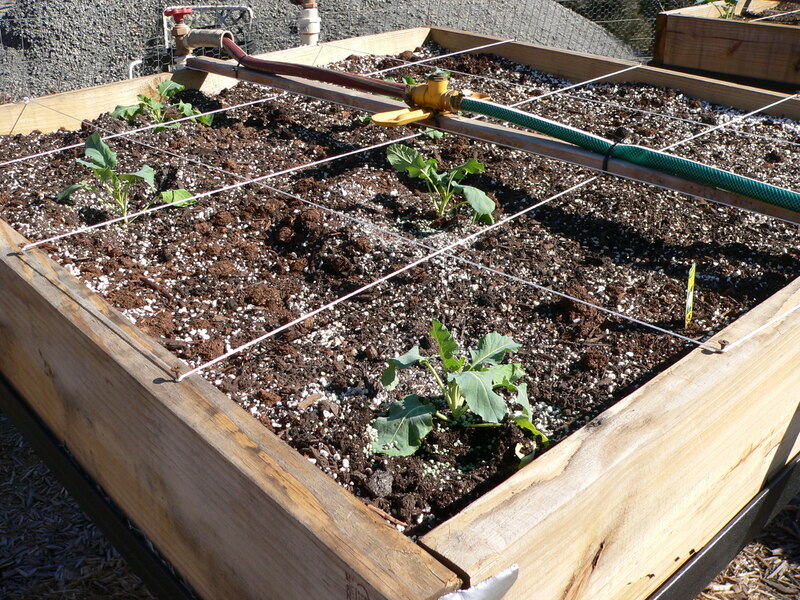 I planted 12 broccoli plants, 12 romaine plants, 12 spinach plants, and 12 iceburg lettuce plants. 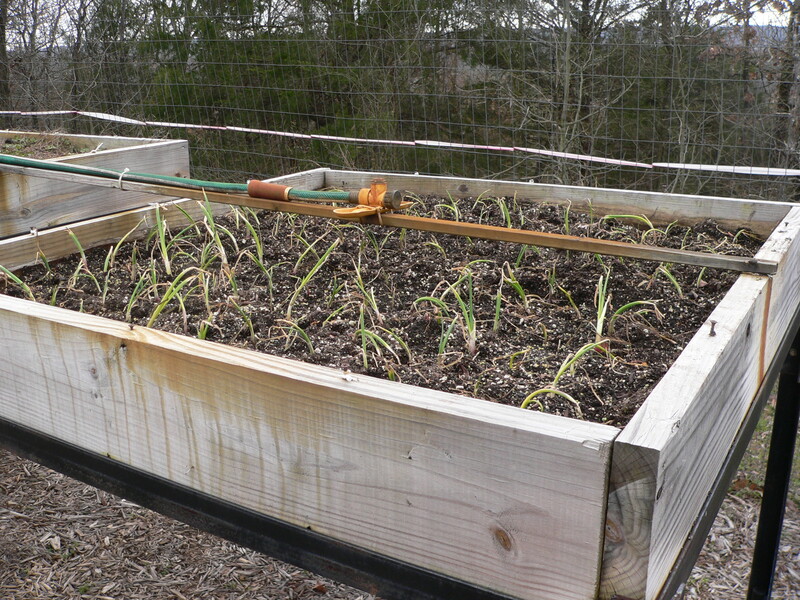 I had already planted two bunches of onion sets. I have several empty squares. 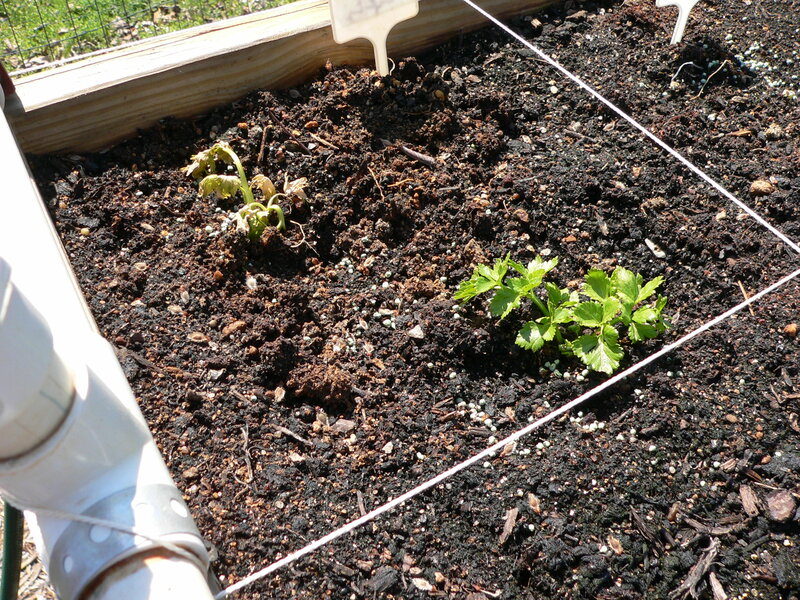 I’ll plant some radishes, plus celery transplanted from plants started in the house later. 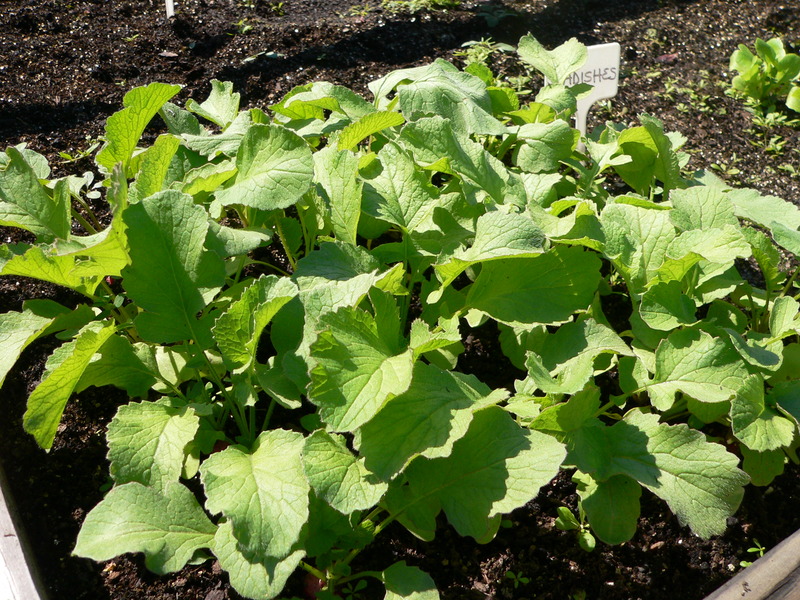 I’m going to play with growing some gourds because my friend Kay brought some seeds to Lunch Bunch recently. 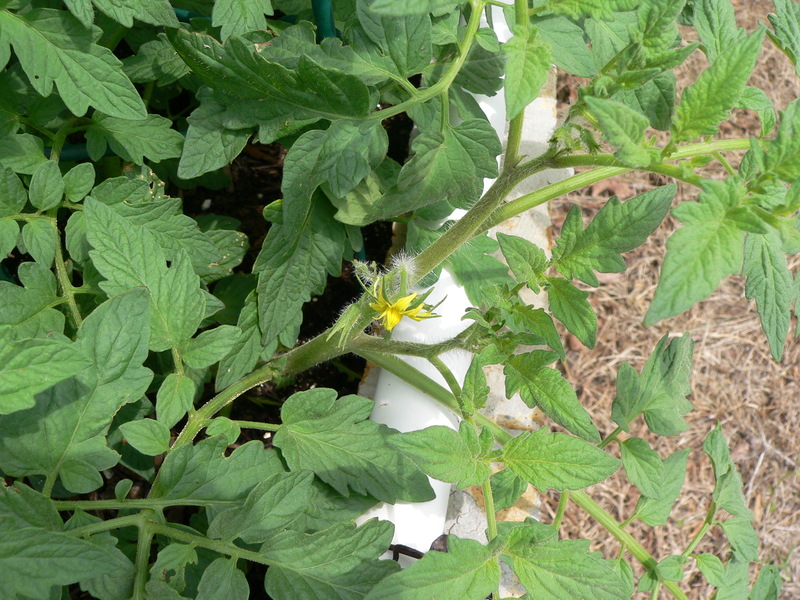 :0) I also have a six pack of tomato plants still in the greenhouse. I’ll wait a couple of weeks to plant them. 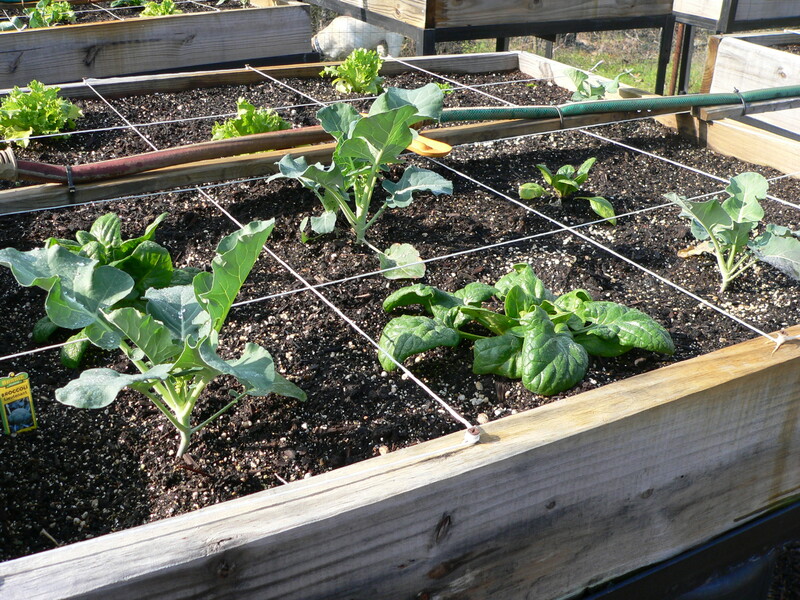 Last year I lost some produce because the plants got too large and crowded each other out in the squares. 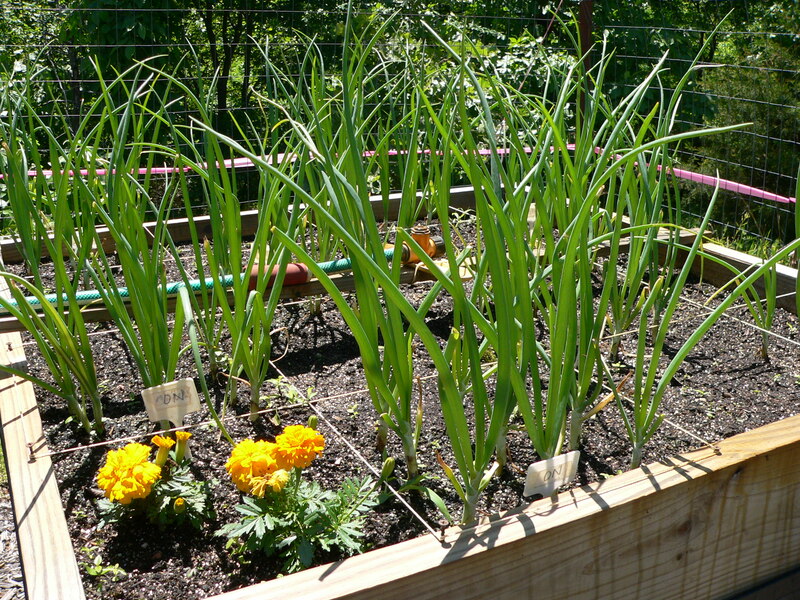 This year I’m only planting one plant per square (other than the onions) and we’ll see how that works. In this picture you can see the line of trash cans along the back of the shop, plus the blue tarp, etc. The light gray trash cans are filled with the components of Mel’s Mix (peat moss, vermiculite, mushroom compost, barnyard compost, and cotton burr compost.) I have our personal composter toward the house. The darker gray trash cans hold supplies for planting. I had some trouble with the end of one of the irrigation hoses being messed up. My good husband came out and replaced the messed up end of hose with a new end and then we could water the garden! 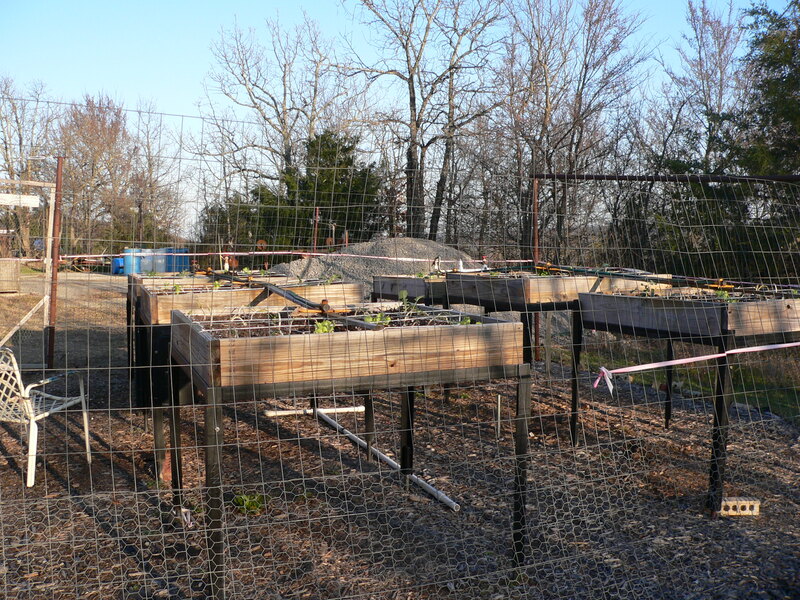 We won’t put the system on a timer until we’re sure all chance of frost and freezing are past. My husband goes outside when the weather forecasters tell him it’s raining in Greenwood – on the Lewis’ house – right now. I have a bit more faith in their abilities, though we both realize that trying to forecast the weather is a complicated task. I just looked up the 10-day forecast for Greenwood on the net and see that today was the last forecast freeze through the 23rd. 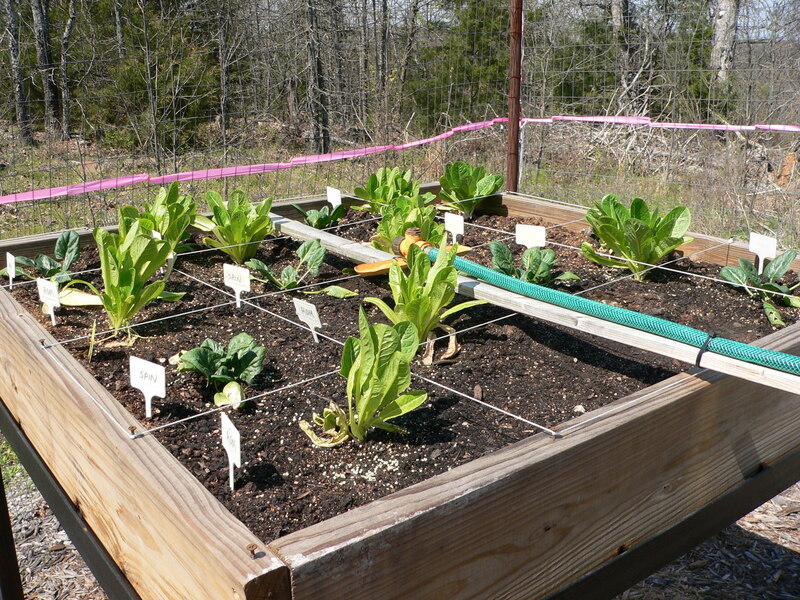 I’ve decided to go ahead and take the plunge, planting the veggies we are holding in the greenhouse. 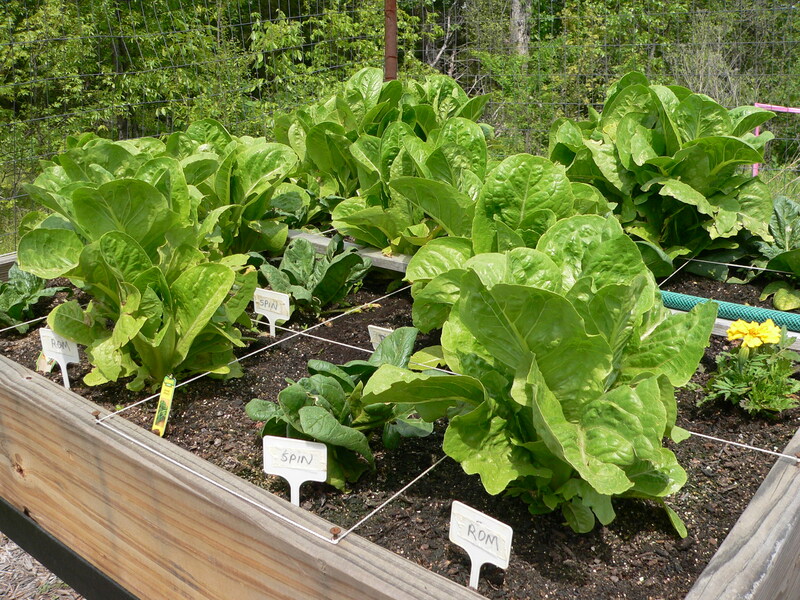 I have iceburg lettuce, spinach, romaine, and broccoli plants, two six-packs of each. 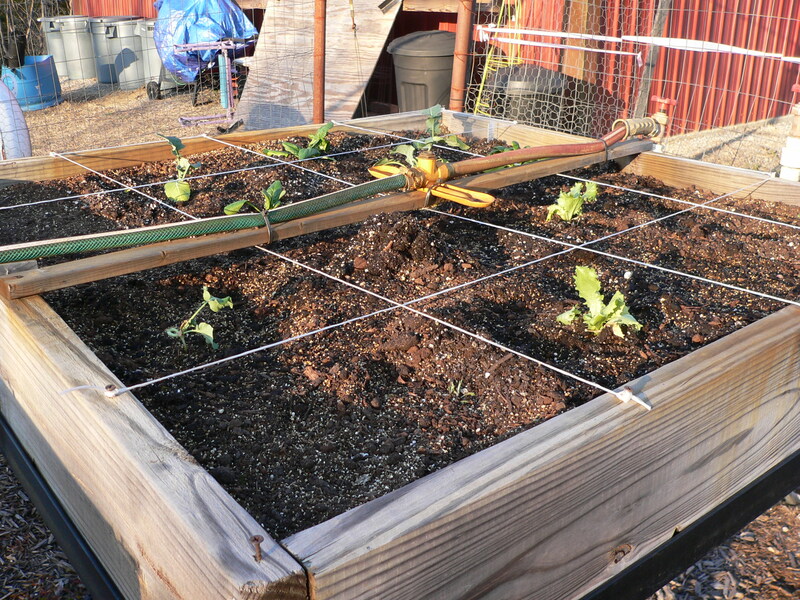 I have my raised bed planters filled with Mel’s Mix and the string stretched across in two directions, creating the squares for planting. My planters are at about chest level so I can just walk up and plant things without having to bend over, get down on my knees or back up again. I planted Texas Sweet Onion sets a couple of days ago. It’s such a pleasure! I’ll take pictures when I get the plants in. I’m excited to be starting a brand new spring crop! I’ll watch the weather carefully, leaping up to put sheets over the plants if they say it’s going to get near freezing for the rest of the month. Isn’t this carrot cute? It’s about an inch and a half long. 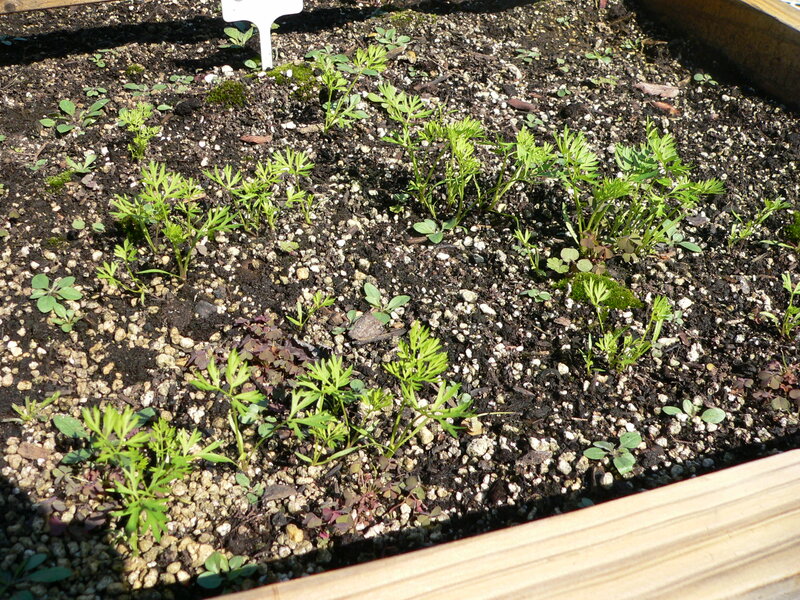 I pulled it up to see what the status was of the carrot seeds I sprinkled in the garden several weeks ago. 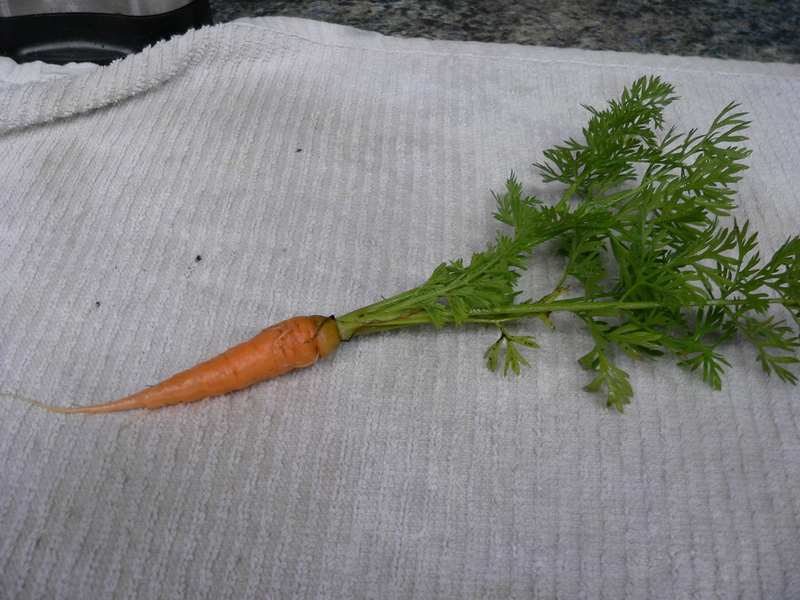 I don’t know if I can keep the garden alive long enough to grow reasonable sized carrots, but these are the first I’ve tried to grow in a long time. I’ll definitely try to get some started in the greenhouse in February or so. 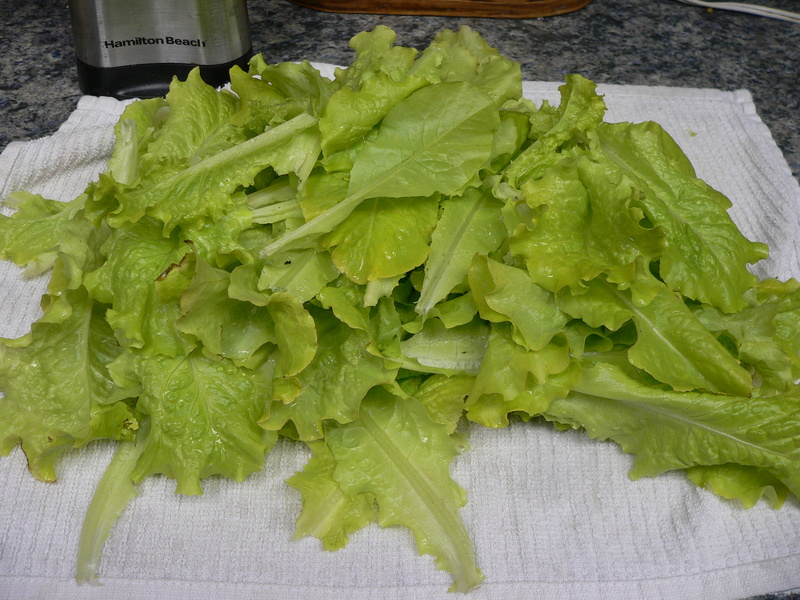 I have so much lettuce We probably won’t be able to eat it all. I’ll give some to my friends as I can. This is Simpson lettuce. 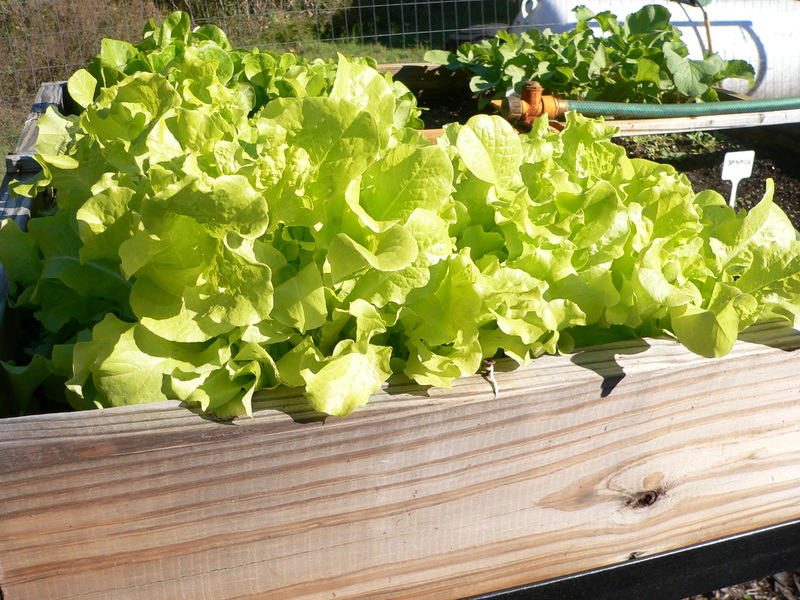 The Bibb lettuce is also doing really well, but I’ll wait a bit longer to harvest some of that. 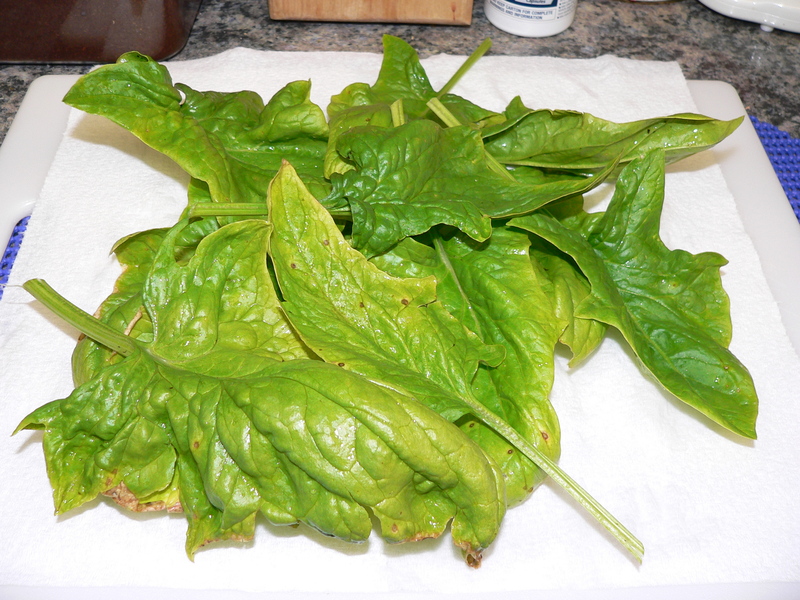 This is from the sole spinach plant I have in the garden. It makes a nice addition to salads. 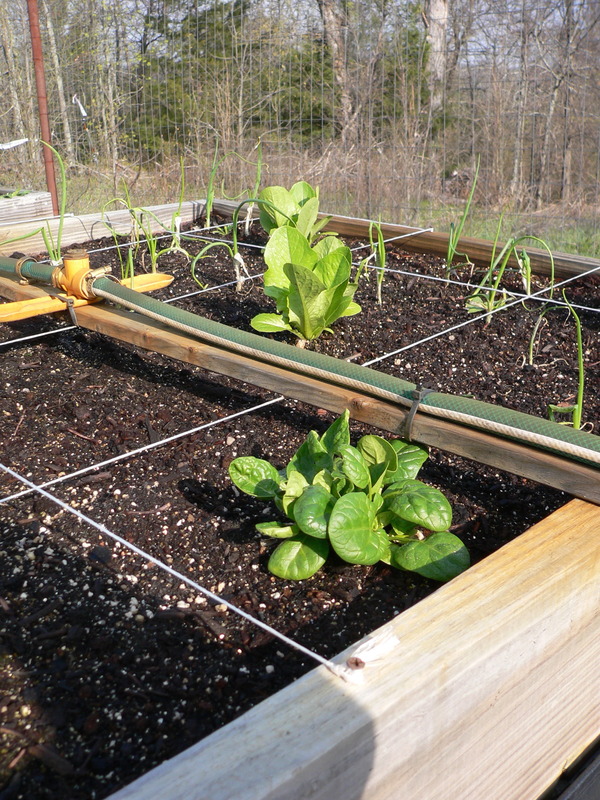 I’m looking forward to trying to get a bunch of spinach started in the greenhouse in late winter, along with lettuce, broccoli, cauliflower, and onions. I have one tomato plant still alive on the window sill in the house. I don’t know if it will live or not, but I’m hopeful. I took Amber out to the garden this morning. I tried to harvest while she ‘helped me’ by trying to move two large plastic pots from the corner of the garden, take them under one of the raised bed planters and chew on them. I discouraged that, so she found some of the black weed barrier under some of the wood chip mulch and managed to pull some up. At this point, I thanked her for her help and put her on the other side of the fence to roam around until I got to a stopping point. 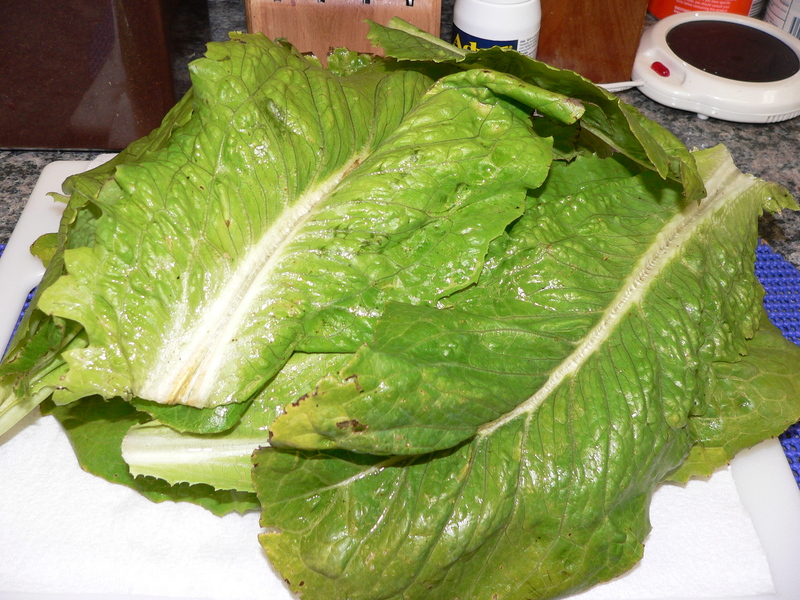 I harvested some of the largest leaves of the Bibb lettuce and Simpson lettuce. 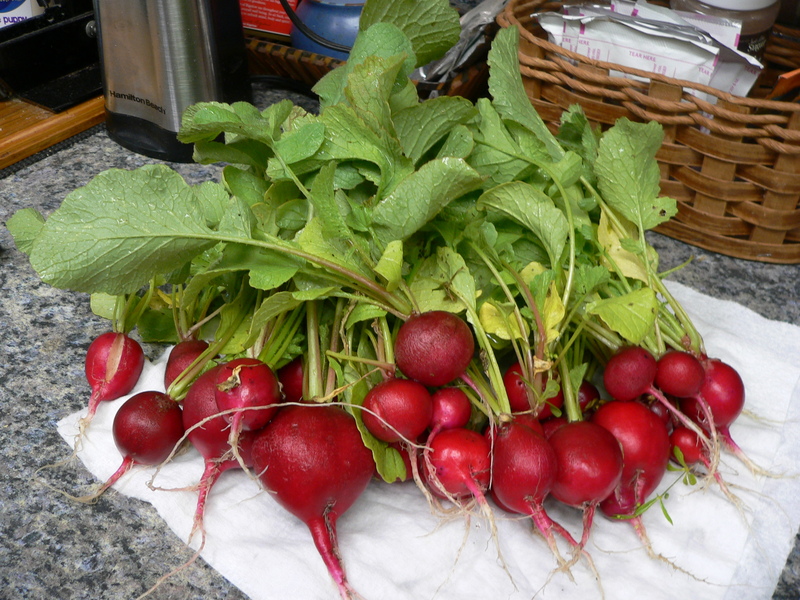 I pulled up all the radishes. I’ll plant more later today, plus two celery plants and one head lettuce plant I started in the kitchen. 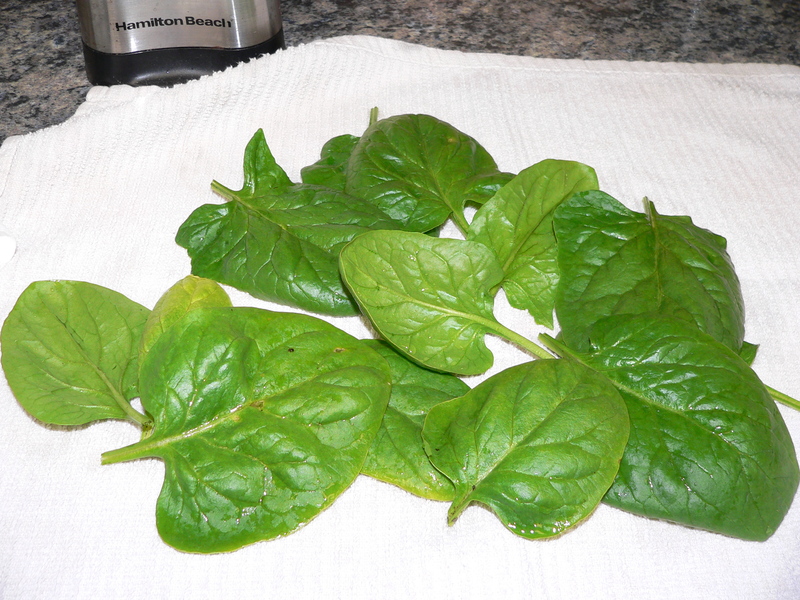 The lone spinach plant is doing very well, giving me 4 nice leaves today. 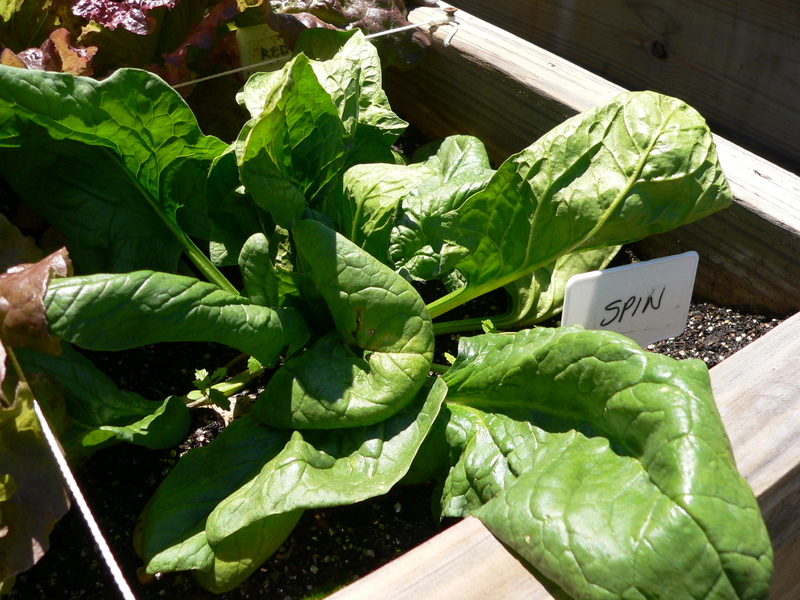 I’ll take some spinach seeds out and plant them, as well today. Also on my schedule is to re-plant several of the Iris rhizomes I dug up and separated this week. I’ll just plan on getting the one planter done today, taking my time on finding good spots to relocate the other iris around the yard. 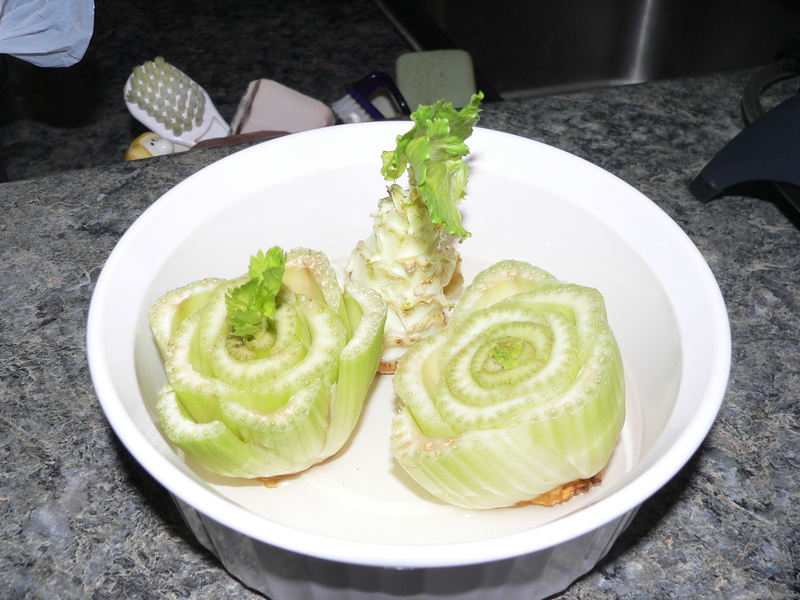 Here are 2 celery bottoms, one of which has sprouted a bit, and a core of head lettuce, which is also sprouting. I’ll move them to the garden soon. 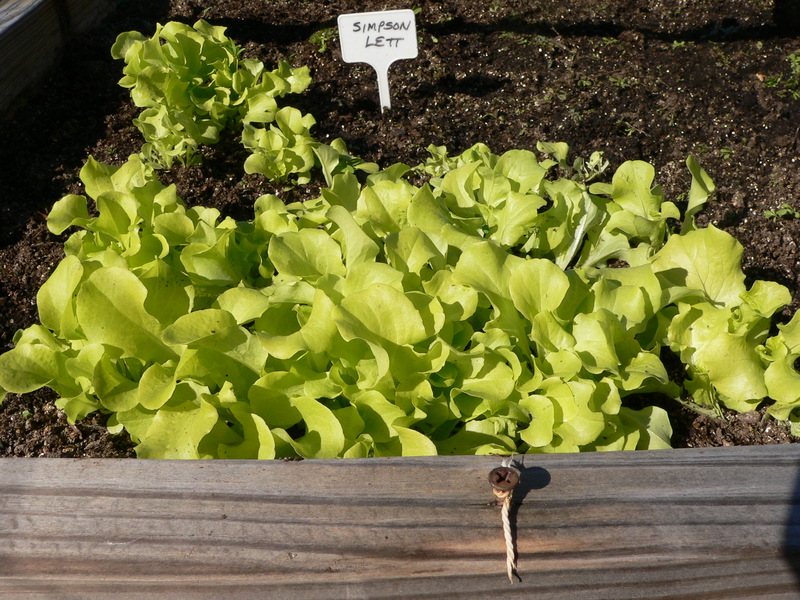 Bibb lettuce, started from seed. 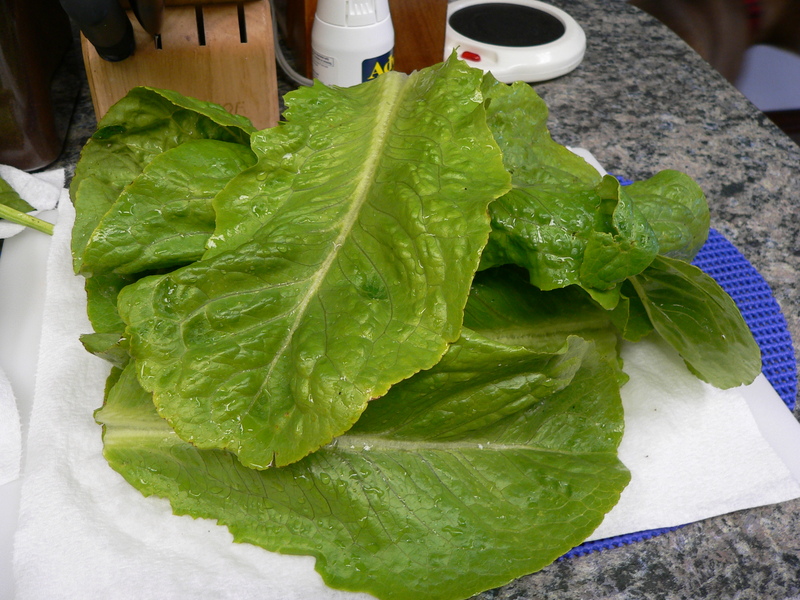 I can start harvesting some of the leaves for salad soon. Carrots. 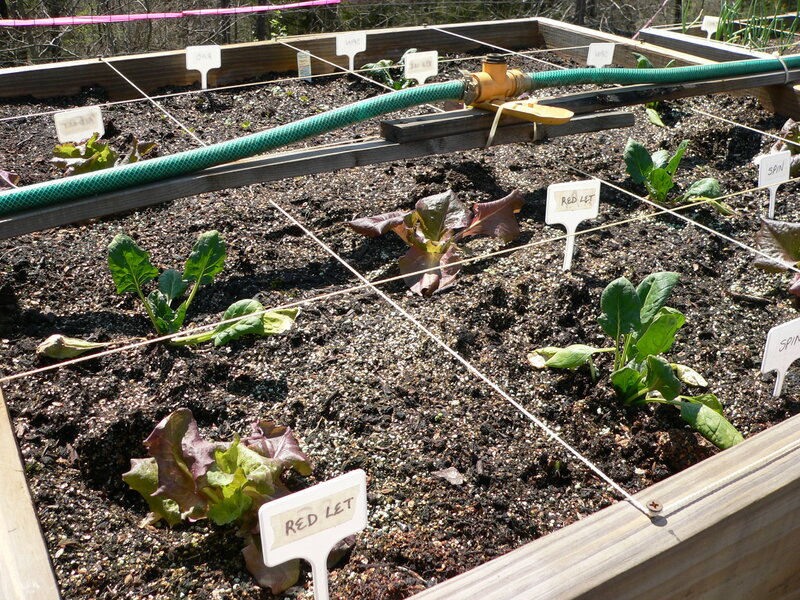 I need to read my square foot gardening book to figure out what to expect here and when. 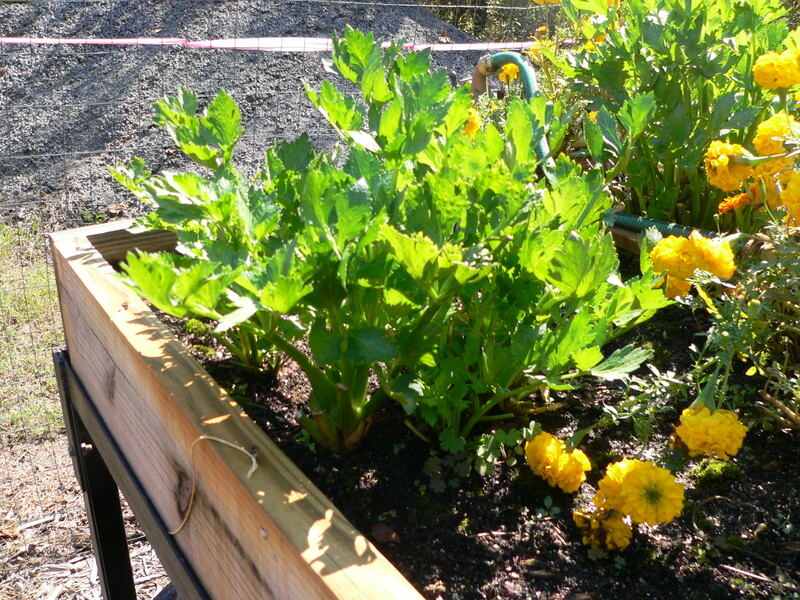 celery plants. I’m harvesting separate stalks, since I didn’t tie them together as I was supposed to do. Simpson lettuce. Some is ready to start using. 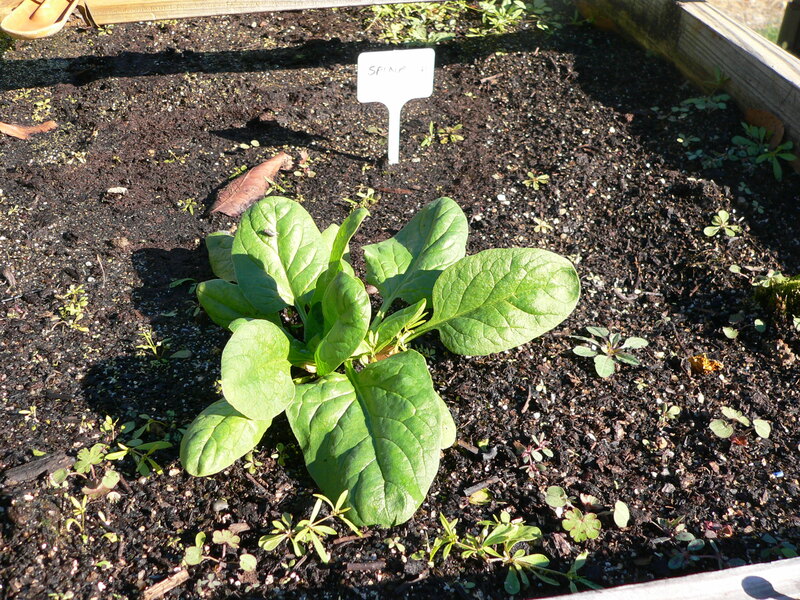 My sole spinach plant. I don’t know what happened that the other seeds didn’t make. 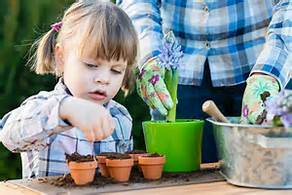 I keep meaning to plant more, but the days get away from me. This is the view as you walk toward my square foot garden. You’d think I was specializing in marigolds! 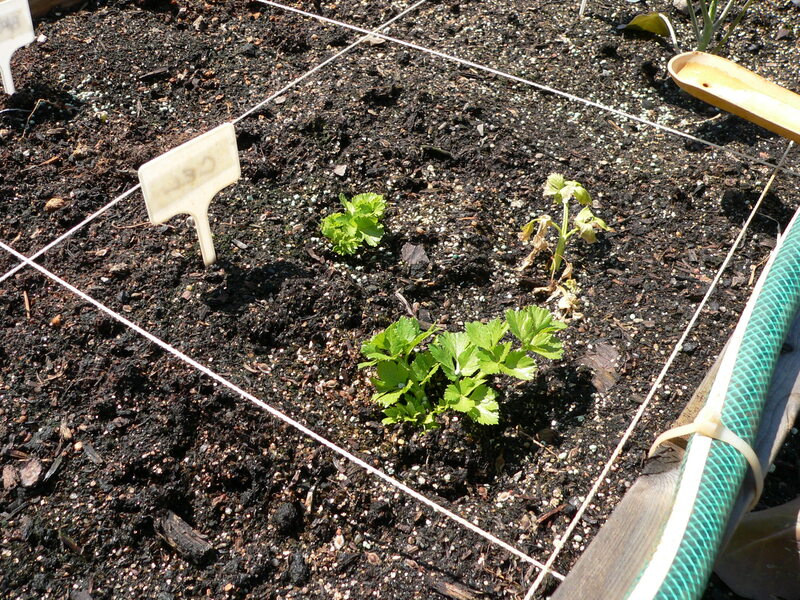 I planted them in several squares in each box, hoping they would help keep the insects down. 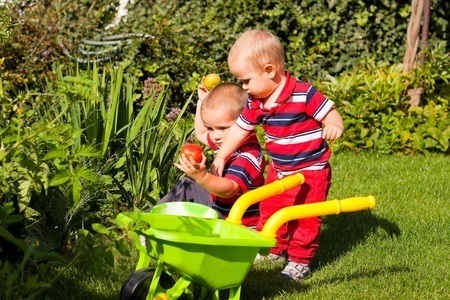 I don’t see that they helped much, but they made the garden look happy. 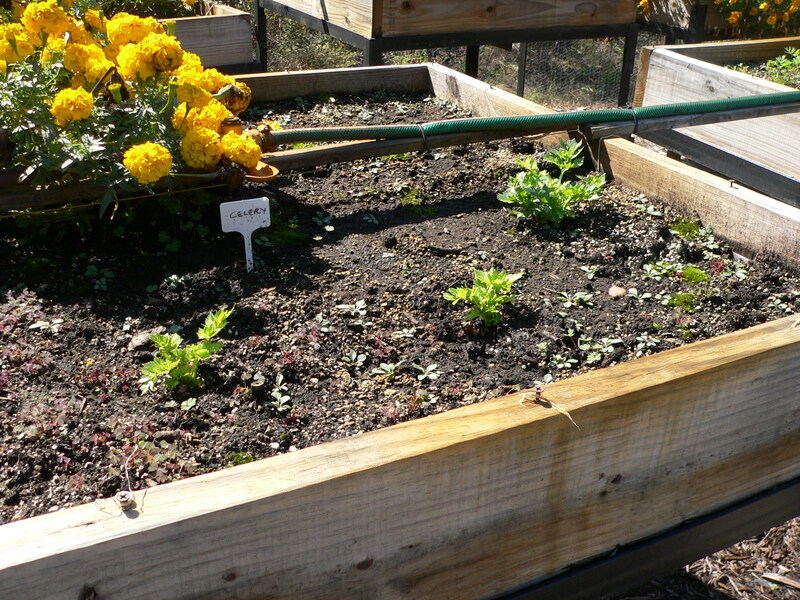 When the spring crops finished, the marigolds were still going strong, so I just left them. Now they’re overflowing. The parts of the boxes not overflowing with marigolds look like this. 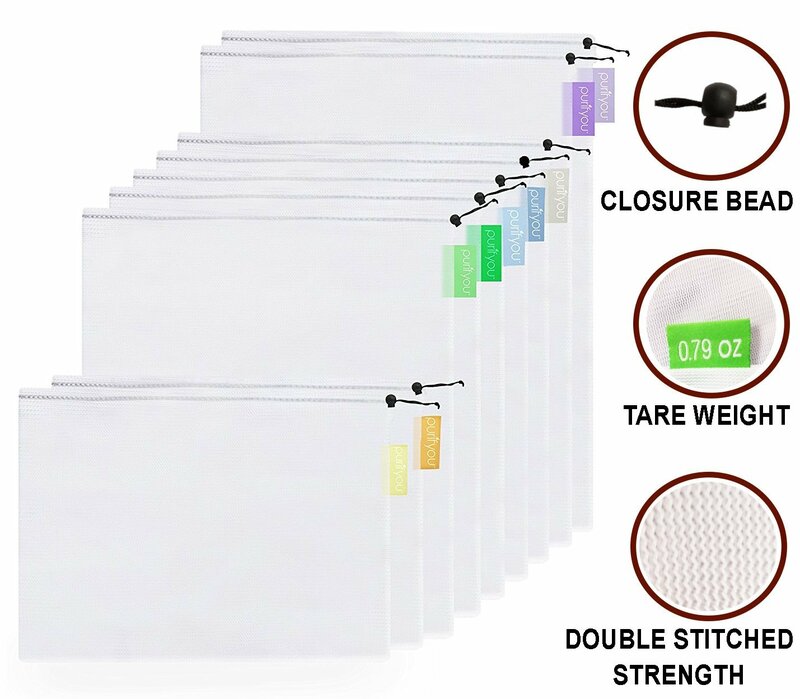 My strings that we strung to demarcate the squares in each box were killed by the combination of water and sun. I’ll use a different kind in the spring. 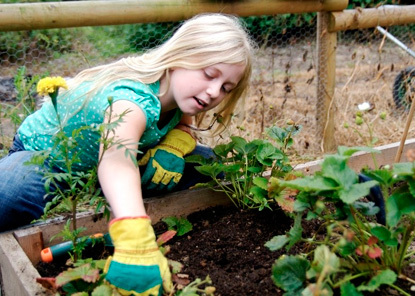 I just went out and sprinkled seeds for the fall garden and hoped for the best. I also started a seed starter tray with peat pellets in the house. 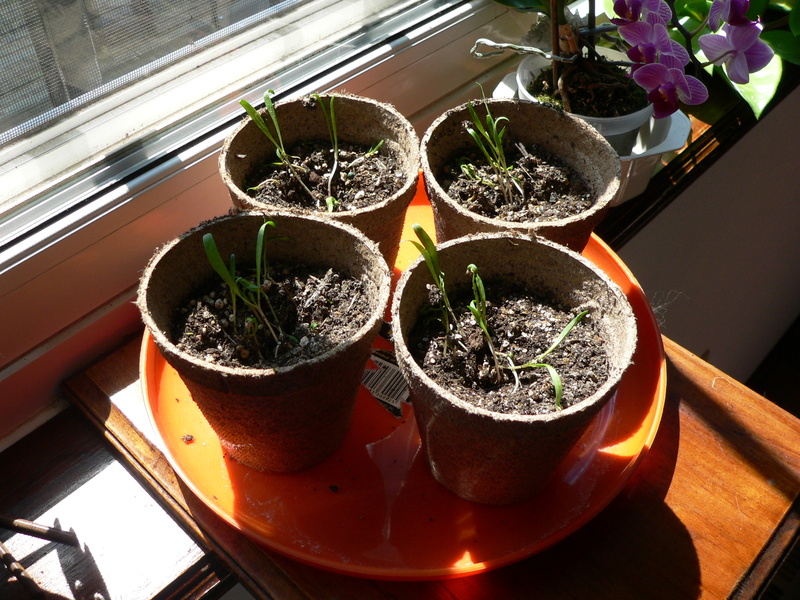 They sprouted, but were looking anemic, while the seeds in the garden were looking better. 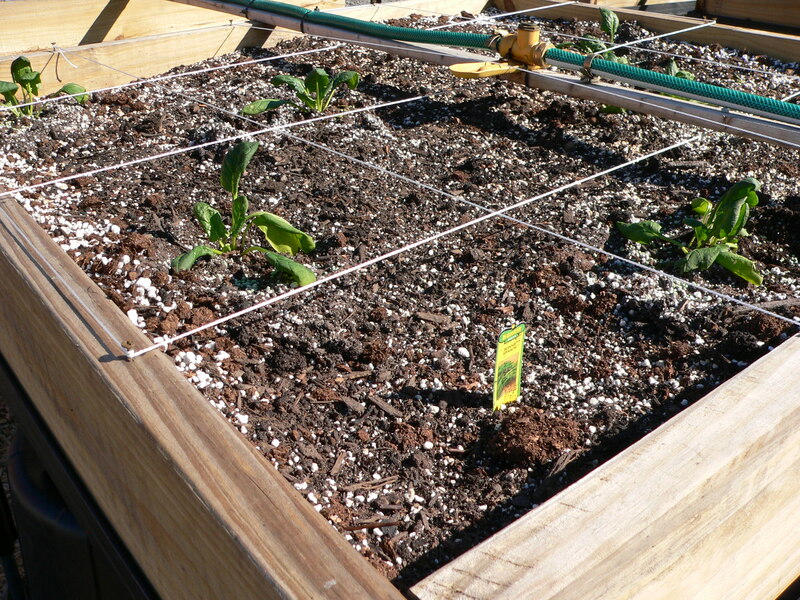 I decided to try putting the tray out on the deck where the seedlings could get more sun and maybe some rain. That turned out to be a mistake. 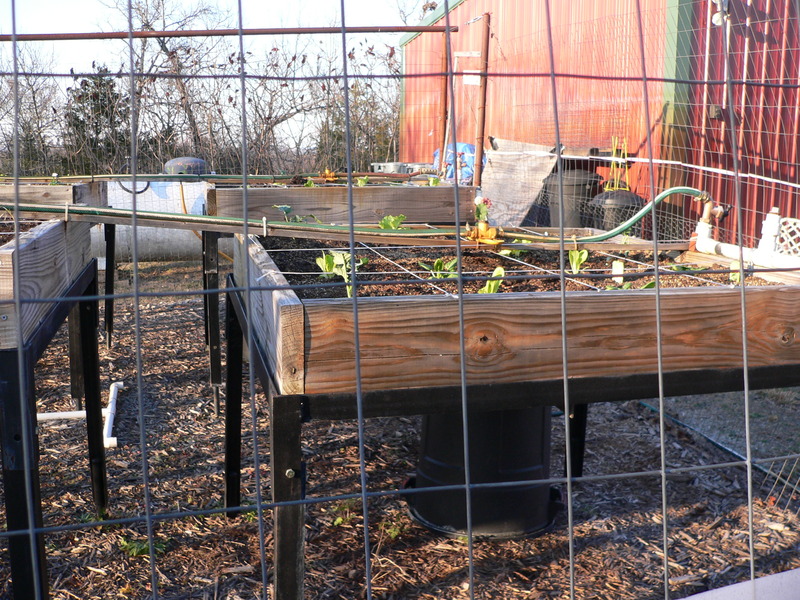 The seedlings croaked, so I cleaned out the planter tray and put it back in the greenhouse. The greenhouse, by the way, is still showing 120 degrees inside today, so it’ll be awhile before I try starting anything in there. 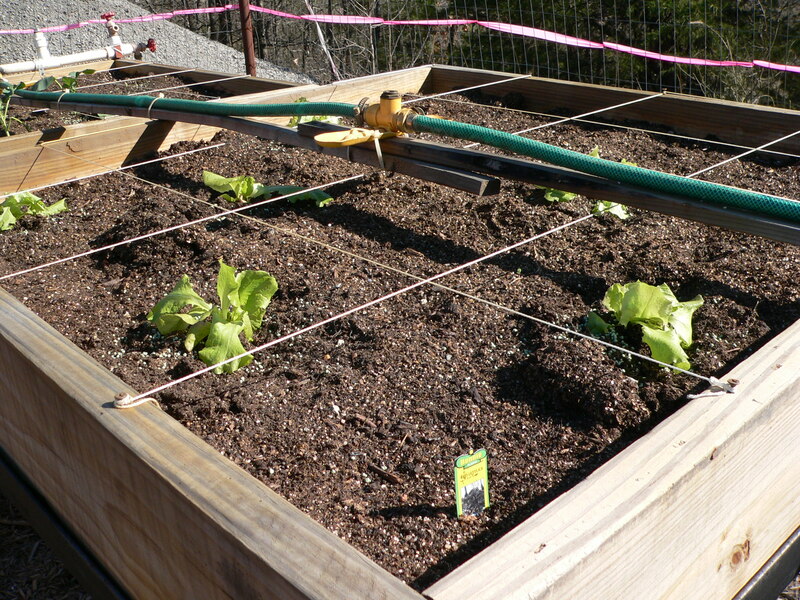 The raised bed square foot garden box above shows one single spinach plant, radishes, and two types of lettuce. 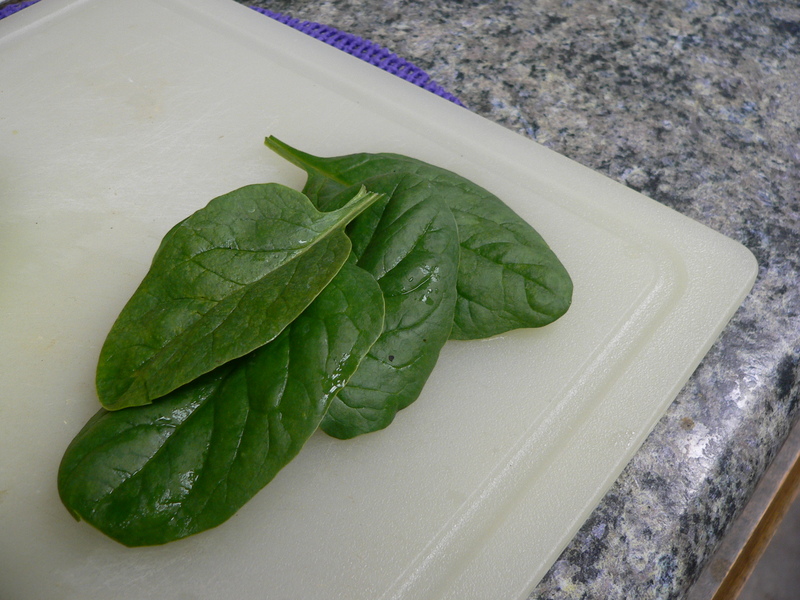 Only one plant resulted from the spinach seeds, but it looks good. I’ll try to plant some more around it, just to see if they’ll come up and produce, now that the weather people are saying we’re due for cooler weather next week. 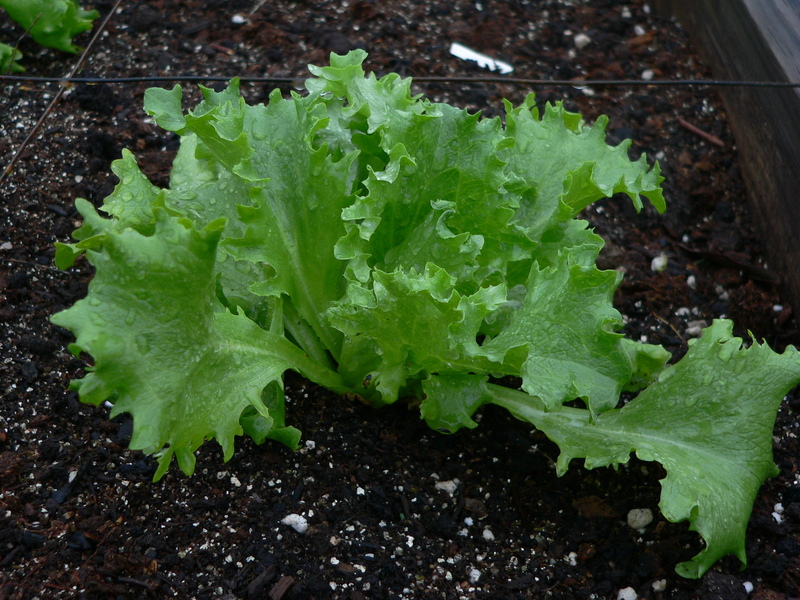 This is a closeup of the Simpson Lettuce. Celery plants that grew more celery after I chopped the whole top off out in the garden! 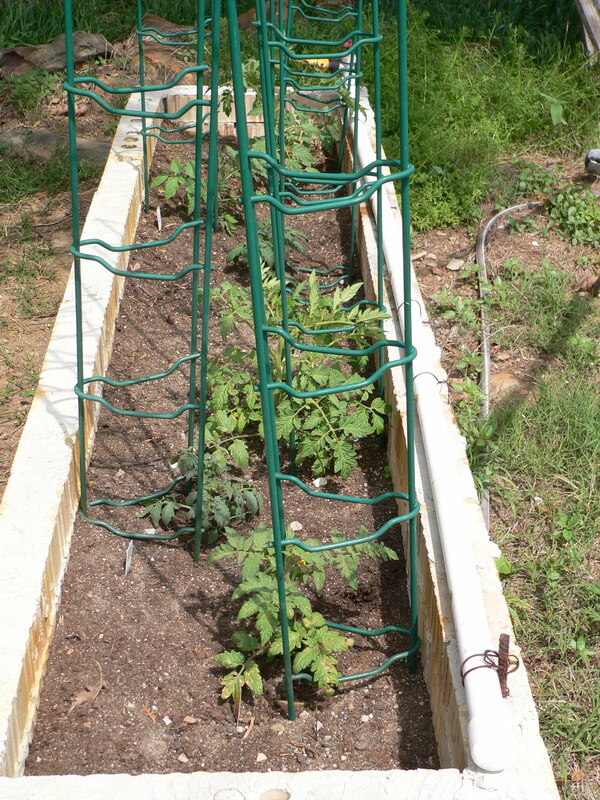 The only other veggies I have going for the fall garden thus far are two tomato plants offered several weeks ago. They still seem to be doing fine. Today I went out to what I hope will be my fall square foot garden. 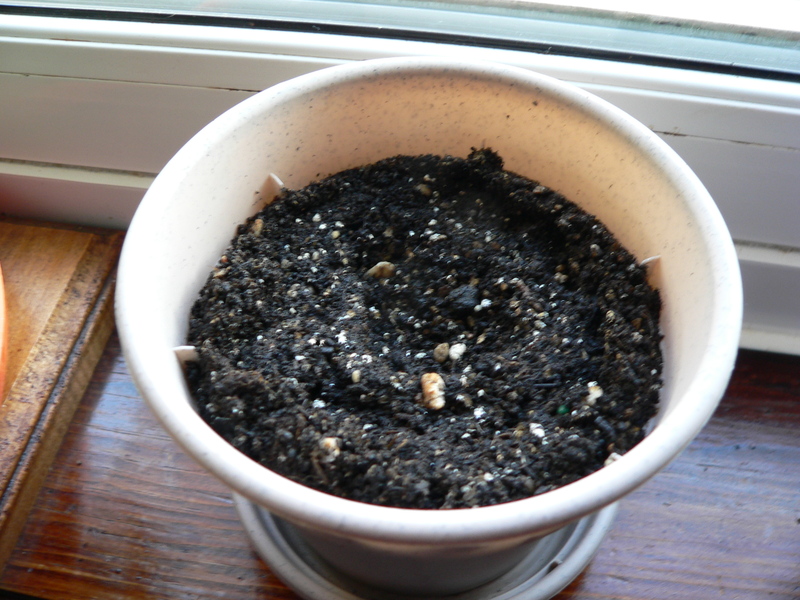 I haven’t been out there since I planted some seeds about three weeks ago. The ones I planted in the plant starter tray are still looking really fragile. I guess I’ll move them outside on the deck where they can get more sun and hope for the best. There were a LOT of weeds in the garden. I made a first pass on the weeding and will spend a lot more time out there later. 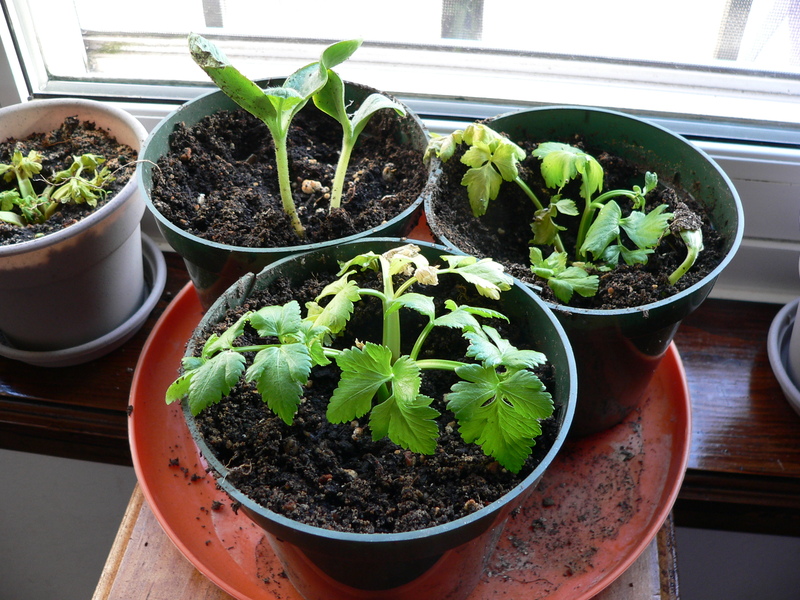 I wanted to take some celery plants I started in the kitchen out there and basically see if ANY of the seeds had sprouted. I’m going to stop here and go take some pics so that you can see what’s happening so far. I planted things fast, and not how I’m supposed to in a square foot garden because I really didn’t expect anything to come up. 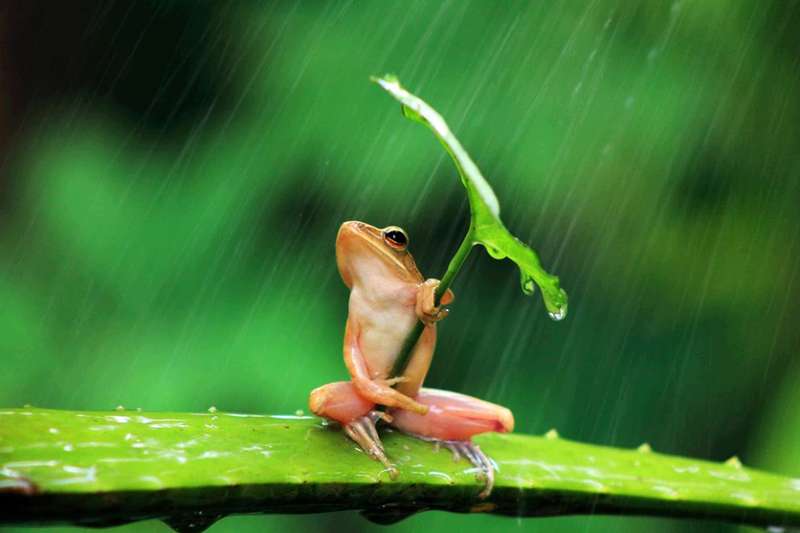 We had no rain – not even a drop – in September, confirmed by our weather people. We also had hotter and more humid weather than usual for the month. Not a great combination. I’m encouraged that I have ANYTHING growing at this point, particularly after getting rid of a gazillion weeds today. 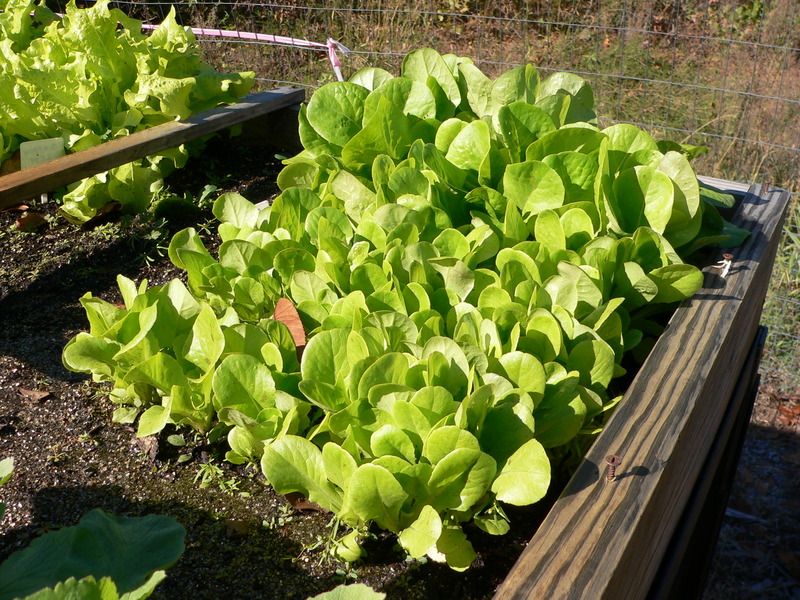 This is Bibb Lettuce. Celery. One neat thing I learned this year is that you can continue cutting stalks off, even to the point of getting pretty ruthless, leaving very little, and the stalks will start growing again! 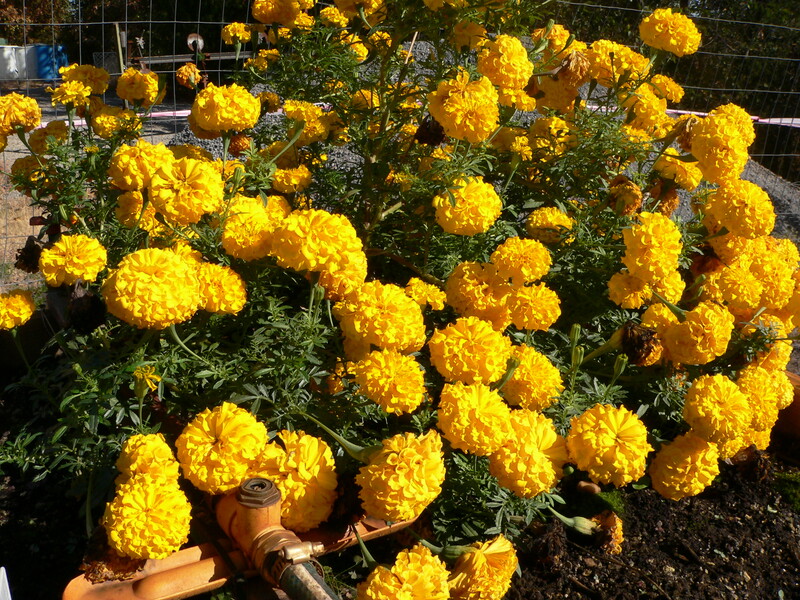 The most successful plant in the garden this year was marigolds. They didn’t do much of a job of keeping insects away, but they look nice. 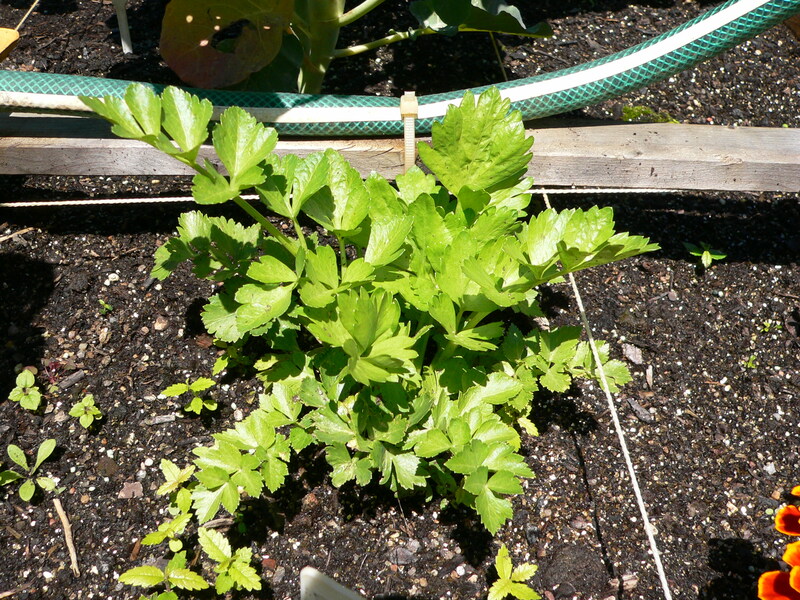 Two different ages of celery plants. I’m going to do another round of planting seeds directly in the garden, since they did better than the ones in the planter starter tray. 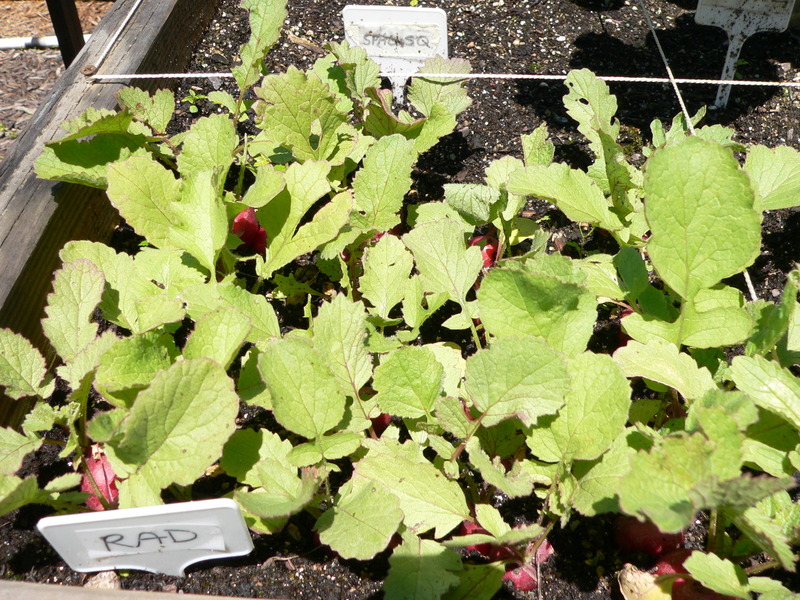 I’ll keep working with the ones in the tray to see if they will get large and strong enough for transplanting. If they’re still slow, they may be the first things I try to grow in the greenhouse! I also have two tomato plants that are about a month old now. One has some blossoms. I don’t know if they’ll do anything before the first frost. If not, I’ll put them in the greenhouse, too. Since I wasn’t able to find plants that I wanted for my fall garden, I planted some seeds and will hope for the best. I planted some inside in a big planter starter thingie with a plastic top and it’s living on one end of our dining area table where it can get some sun. The others I planted directly in the garden, again hoping for the best. 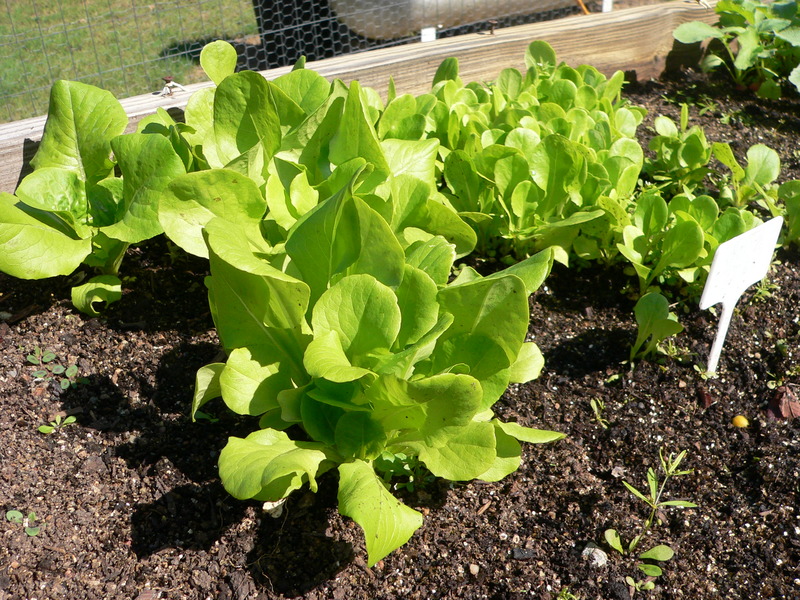 I planted Bibb Lettuce, Simpson Lettuce, and Spinach inside, and planted those, plus radishes, carrots, and 4 celery plants I started inside. There isn’t anything to see yet, so no pics. 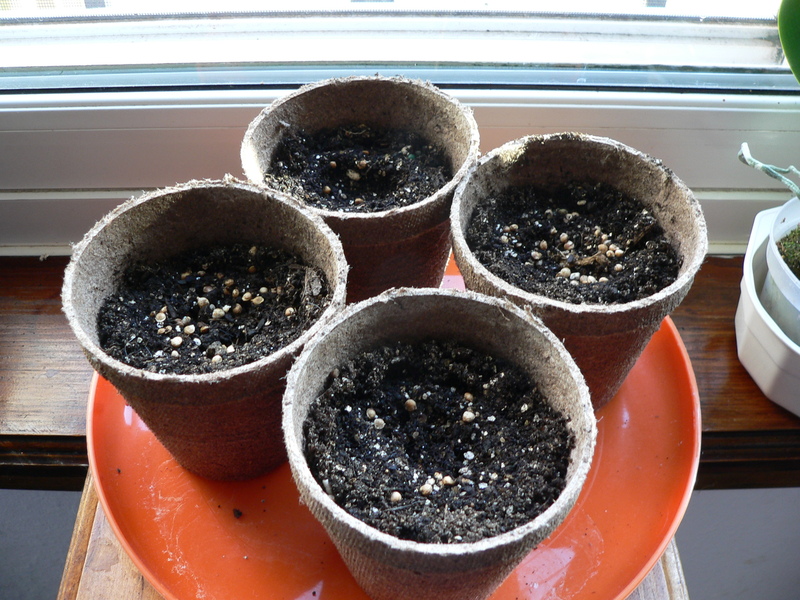 Since I’m aptly named the ‘Serial Seed Killer,” I may not get much, or anything, but I’m hopeful that ONE of the methods I used will be successful. Here’s hoping! 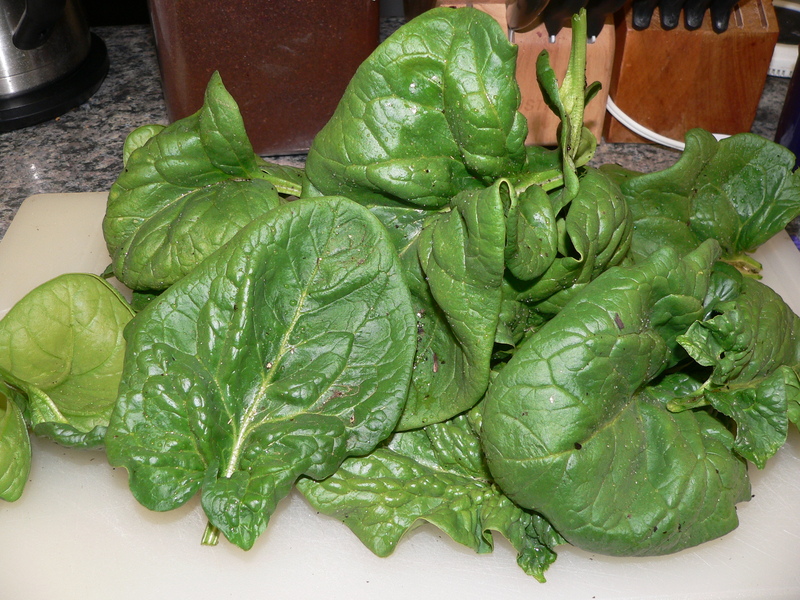 I’m still mainly doing cleanup from our recent storms, but I got a nice batch of spinach today. 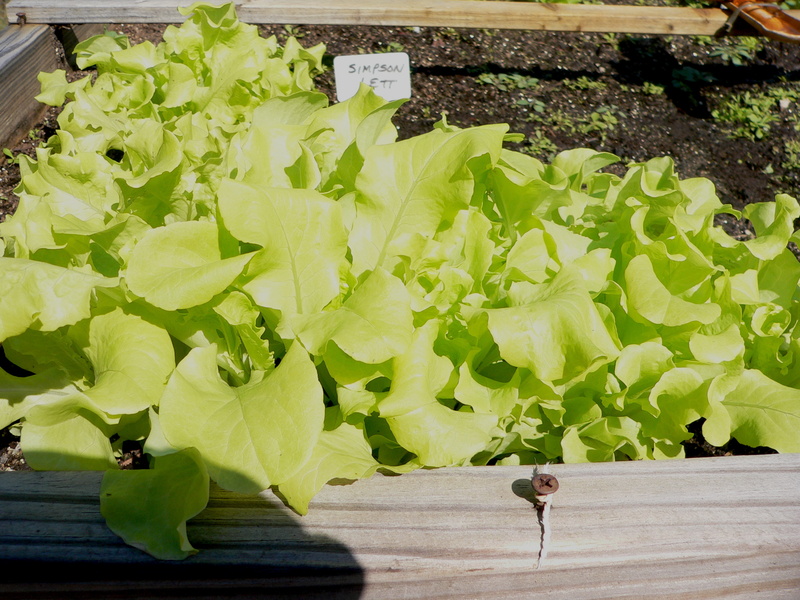 Our weather has turned really warm and humid (except for today) and the lettuce is starting to bolt. 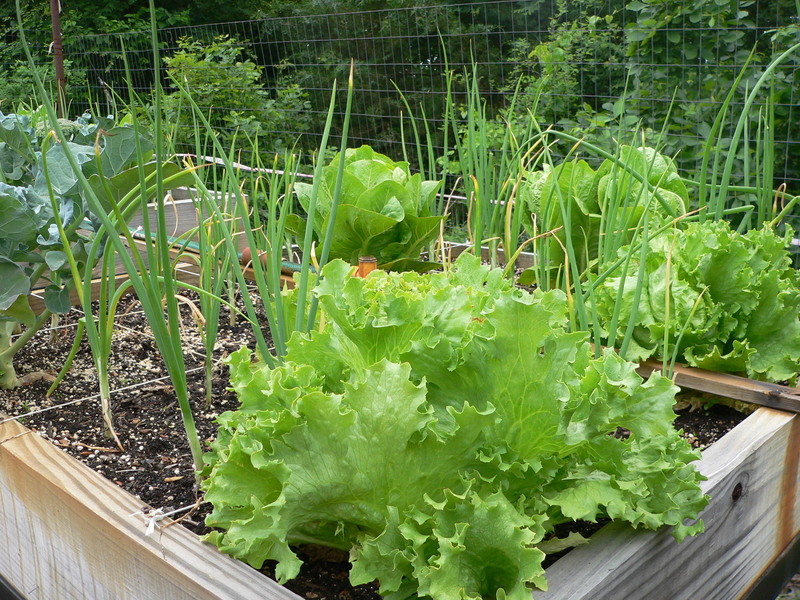 I’m hoping I can harvest a lot more before the plants are done until I plant more for the fall garden. 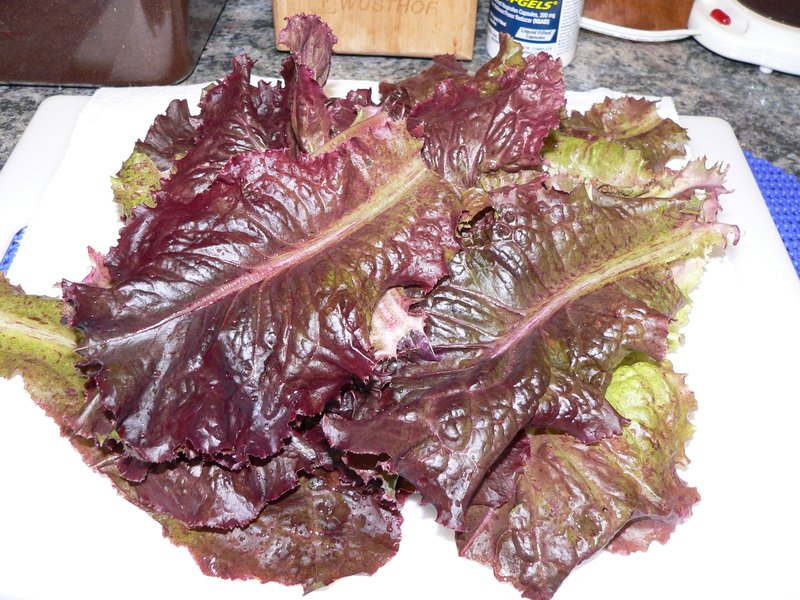 This is red leaf lettuce. My husband wants me to plant iceberg lettuce. We don’t get the plants in this area for some reason. 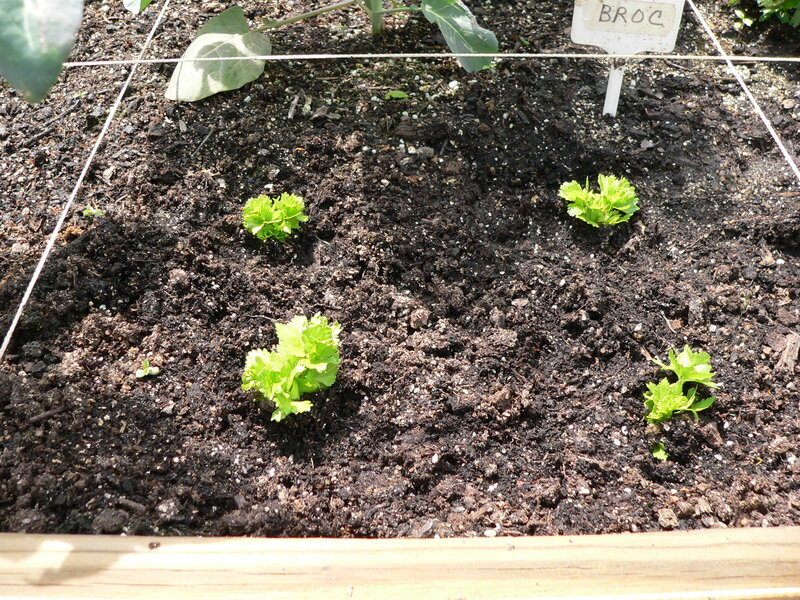 When we get our greenhouse finished, I’ll plan on trying to start some iceberg lettuce seeds for the fall garden. 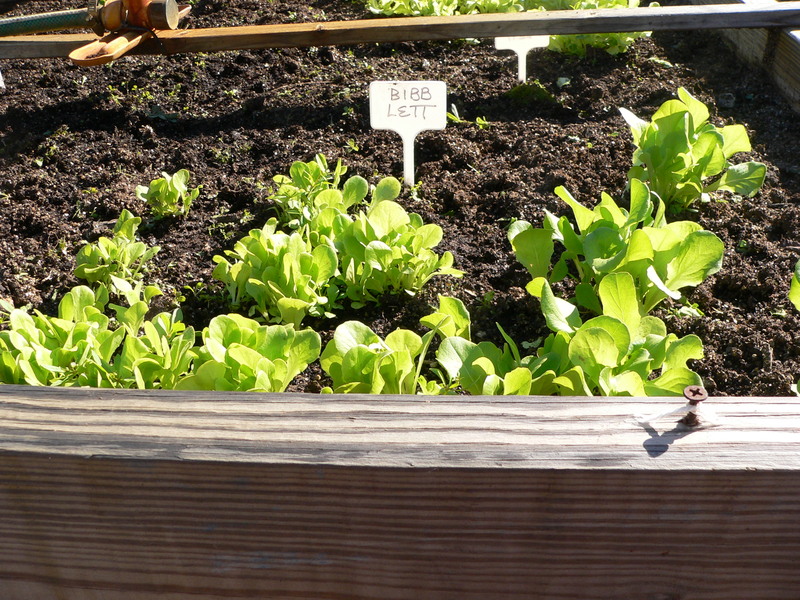 Meanwhile, we have some delicious, fresh-from-the-garden goodies for a big salad tonight. 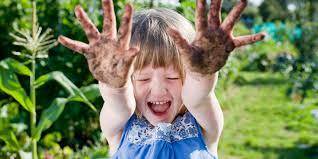 I’ve just come in from a little over an hour of weeding and pruning in the garden. The pictures here were taken BEFORE I did that, ad I’m cringing a bit that you can see some little weeds and leaves that need to be removed, etc., but I wanted to share my delight in how well things seem to be doing now. 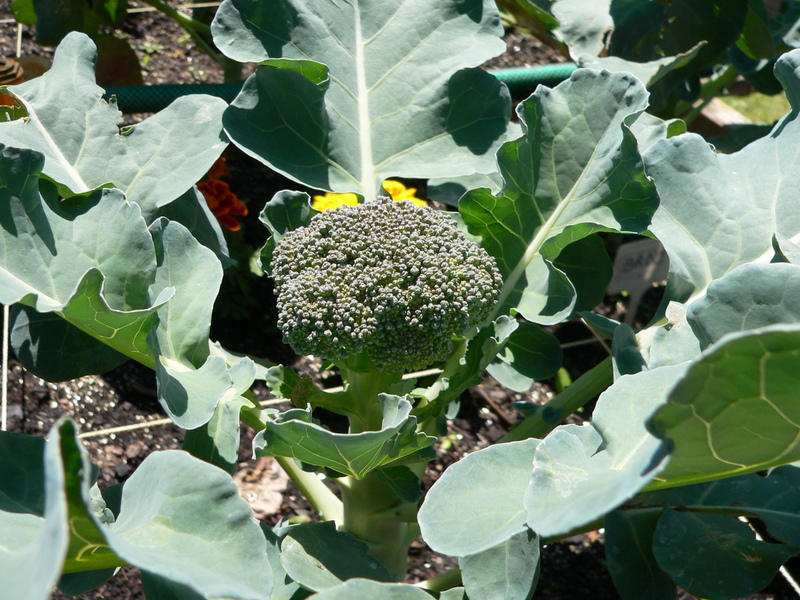 I actually have little bitty heads of broccoli coming on! 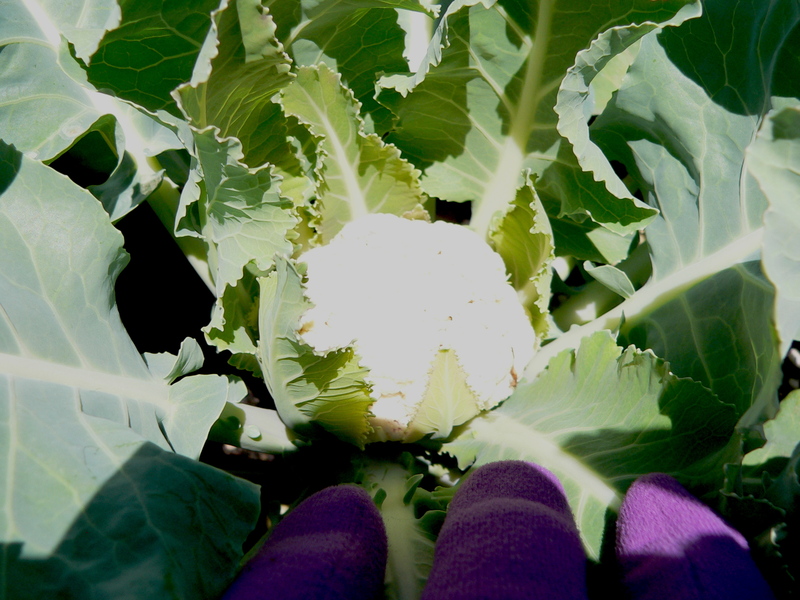 This is a terrible picture, but I have TWO cauliflower heads showing! 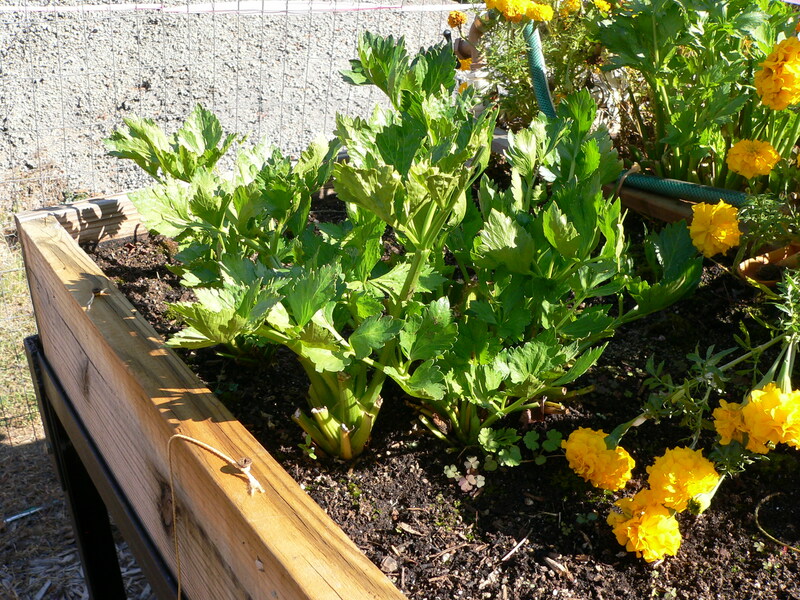 This is the largest celery plant, though I have several others. No clue yet whether I’ll actually get a stalk or not. (See what I mean about the little weeds? Most of them are gone now. These are Georgia Sweet Onions. They seem to be happy now, rebounding from the hail storm. This is one of two squares of radishes. This is the largest of the spaghetti squash plants I started from seed in the house. 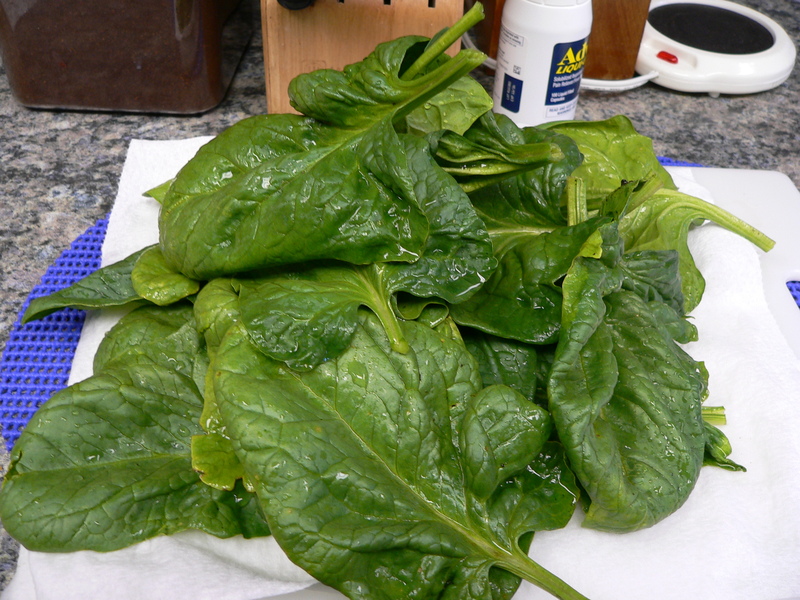 And spinach. I was so delighted to find plants for sale this year at the local co-op. I hope that I thanked the guy effusively enough that he’ll try to get them again and again. I can’t be the only person looking for them and wanting to grow it. 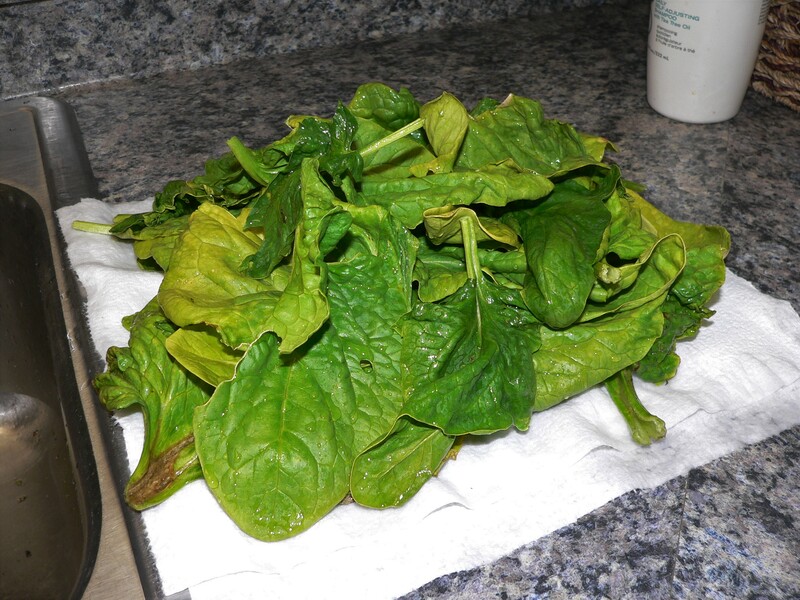 Does anyone have directions for how best to cook fresh spinach leaves? After the hail storm, I cut off lots of broken leaves. We had good eating from the sweet, broken plants, but it was sad to see everything so battered. Today, things have rebounded and I got our first real harvest of the year. 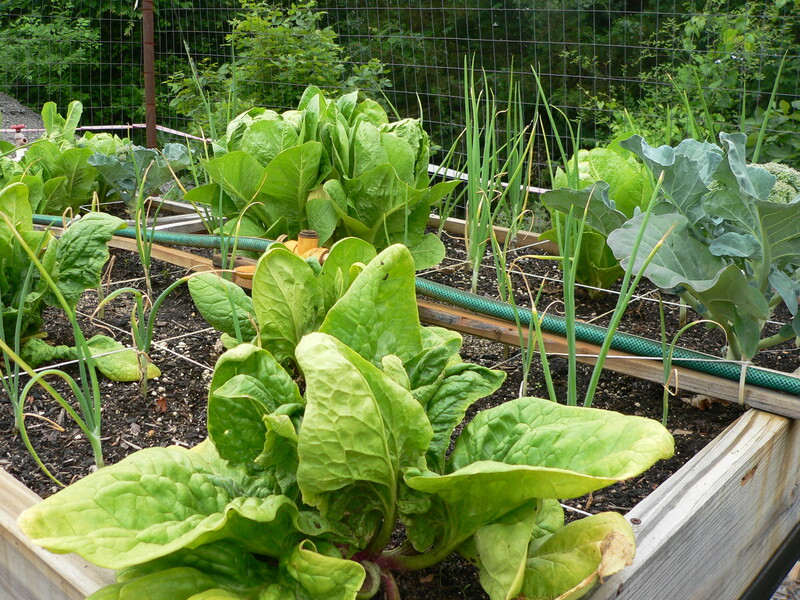 I could have harvested much more, but I’d like to ‘eat our way through the garden,’ if possible this year. 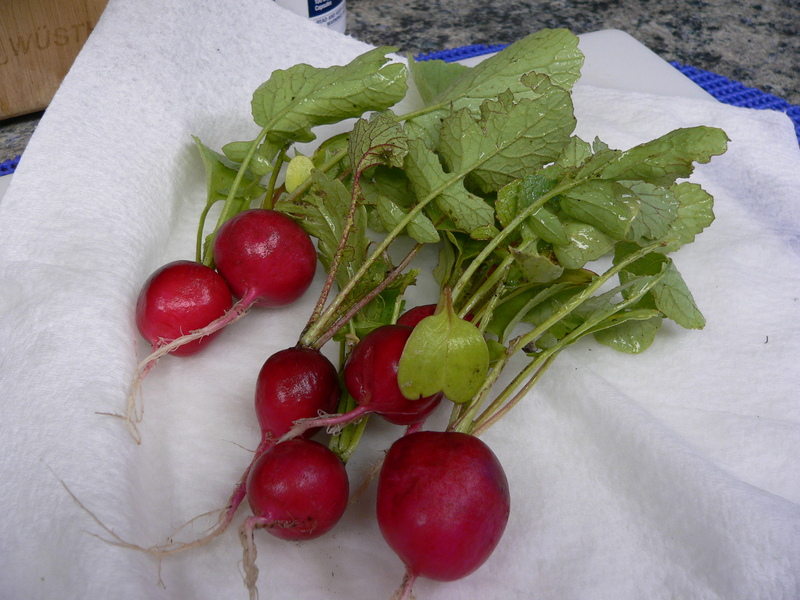 These were the largest of the radishes so far. My husband came in just as I was finishing washing everything. He said he’s looking forward to a big salad with our grilled steaks tonight! Not long ago I posted pics of our garden, battered by a hail storm and eaten by ‘someone’ other than us. Happily, the garden seems to be rebounding! We’ve still had too much rain for me to start really trying to combat the insects, but I cut off and cleaned things out, bringing in what was good to eat and composting the rest. 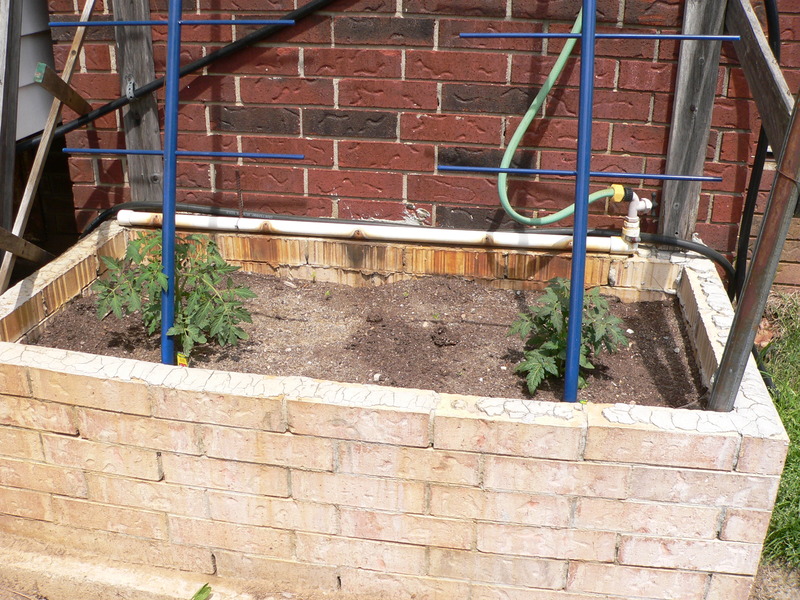 These are the tomato plants in what we call “the nook” – a planter we built beside the back porch behind the easternmost part of the house. The plants are more protected here from the gusty winds we get, so sometimes, these are the only tomato plants that do well. 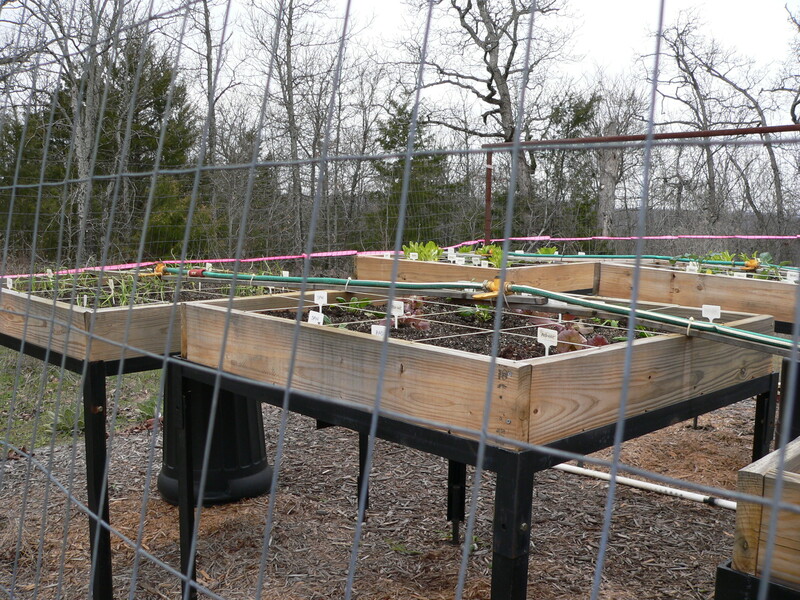 My husband built some super-sturdy things to which we’ll tie the plants as they grow, since the medium grade tomato cages collapsed with the weight of the plants last year. 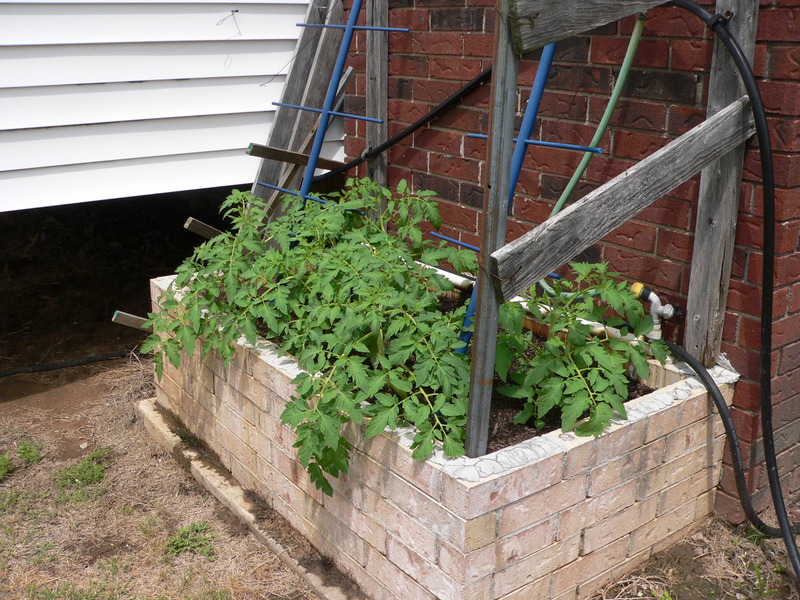 The is the brick planter to the east of the house that we also converted to be a square foot planter. 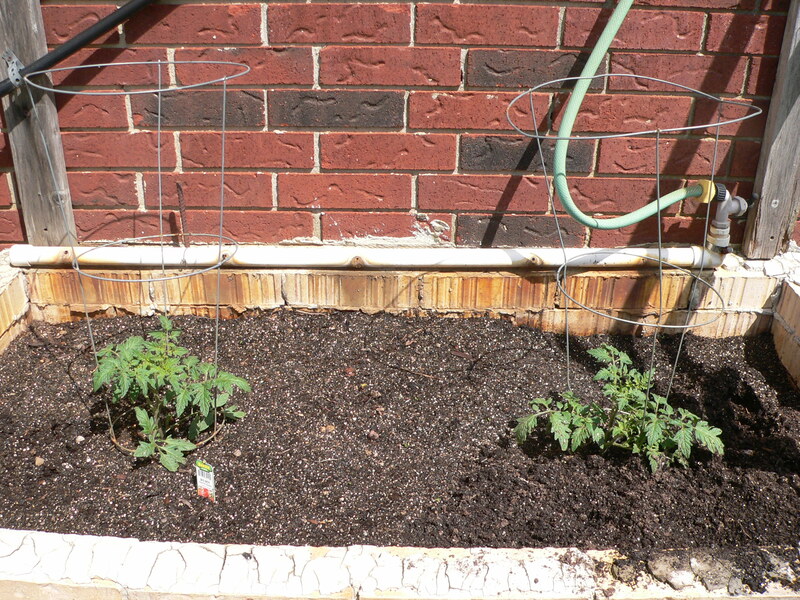 We now have six tomato plants, planted at three different times, hopefully to expand our tomato eating season. 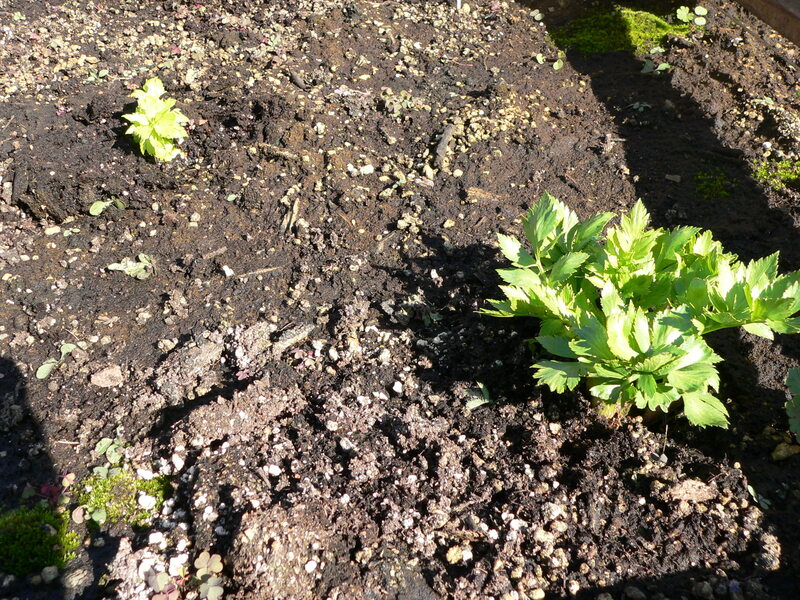 These are newly transplanted celery plants. 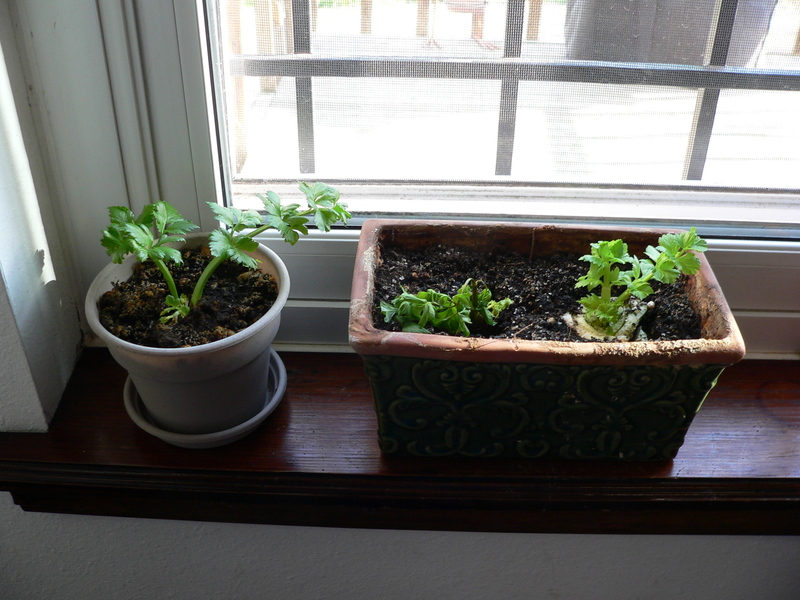 I cut the bottoms off celery bought at the store, plopped the bottoms in glasses of water, and put them on the window sill. 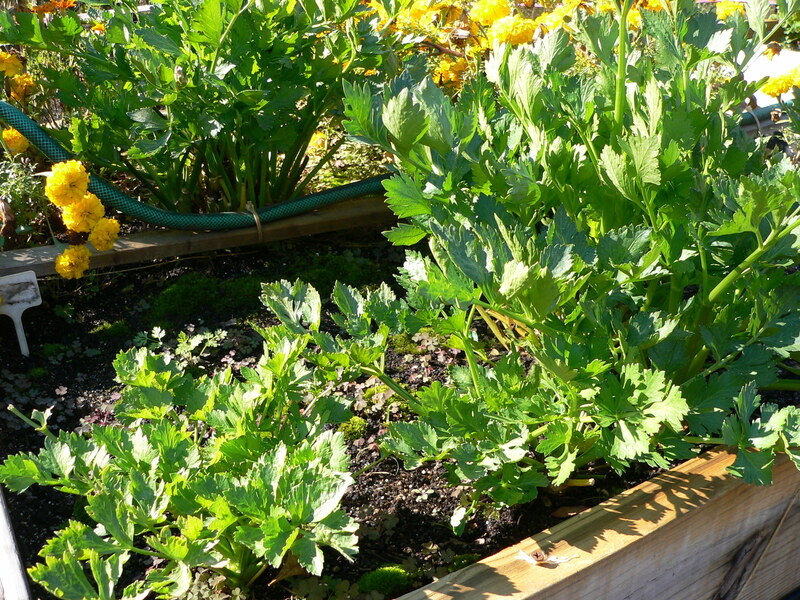 These are older celery plants. I have no clue if I’ll actually get celery to eat, but I’m sure having fun trying. 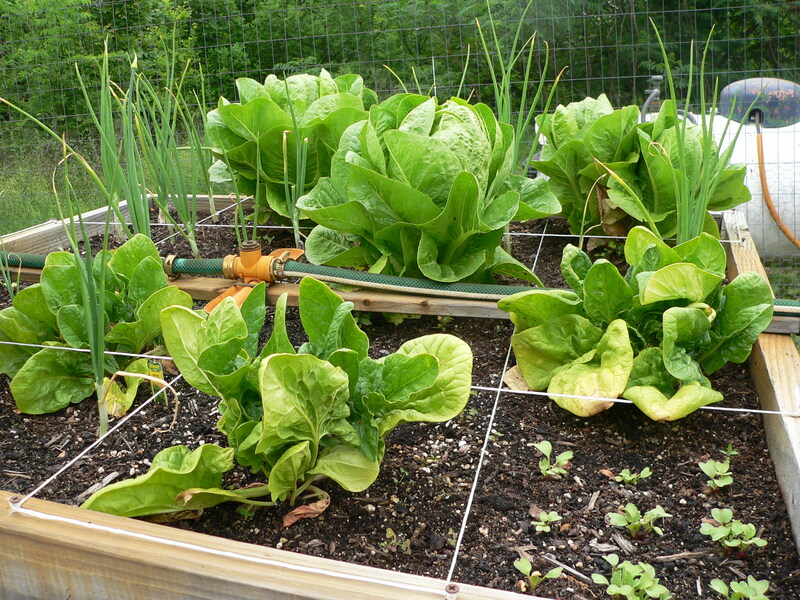 The romaine lettuce and spinach have rebounded. 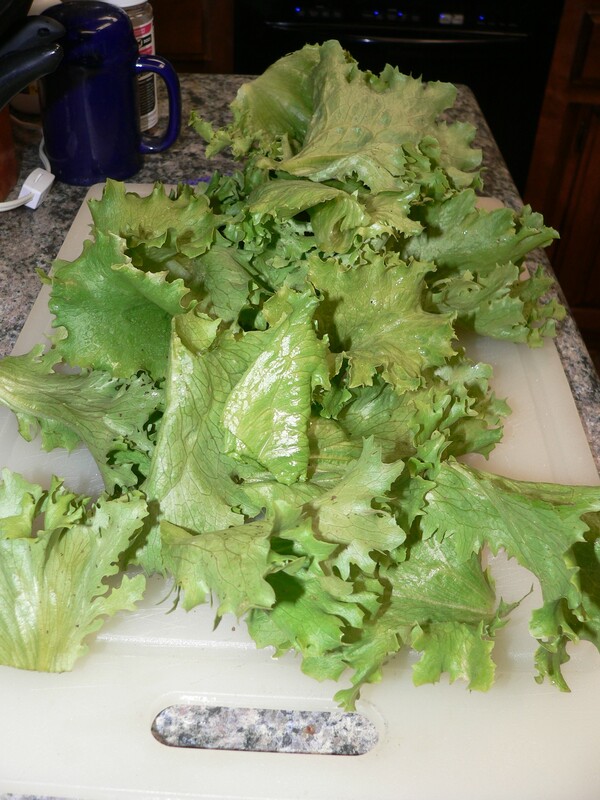 We’re still enjoying the harvest of broken leaves I gathered after the hailstorm, but the plants seem happy now. 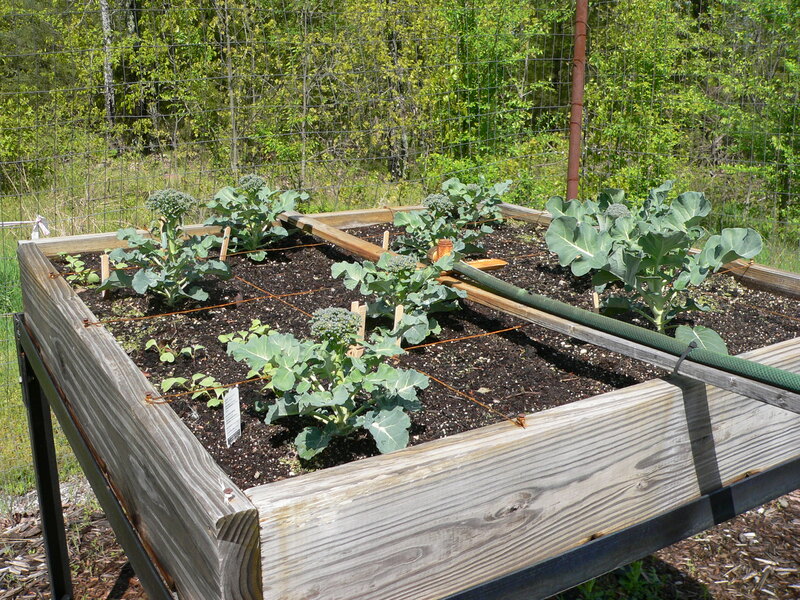 The broccoli and cauliflower plants look pretty good. I don’t know if I’ll actually get much from them. 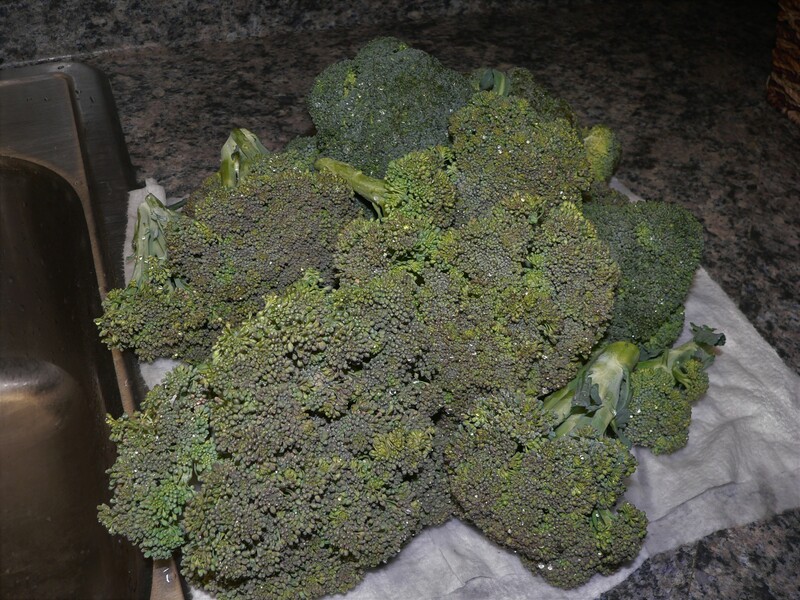 Last year I had good-looking plants, but not much actual broccoli and cauliflower to harvest. It has lightened up outside now, but the wind is really whipping our tree branches around. The forecast is for scattered showers (80% chance) the rest of the day today and into tomorrow, so I won’t be outside again, probably, until Tuesday, when I hope to get more flowers! I’m very happy that our garden is alive at all right now. 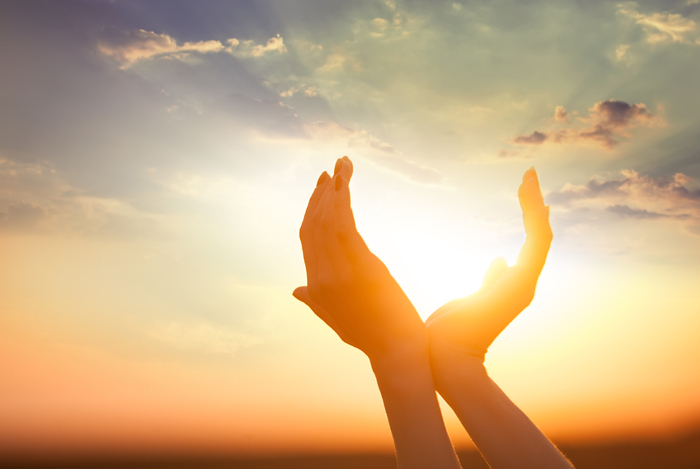 Our weather has roller-coastered between hard freezes and a high of 90 today. 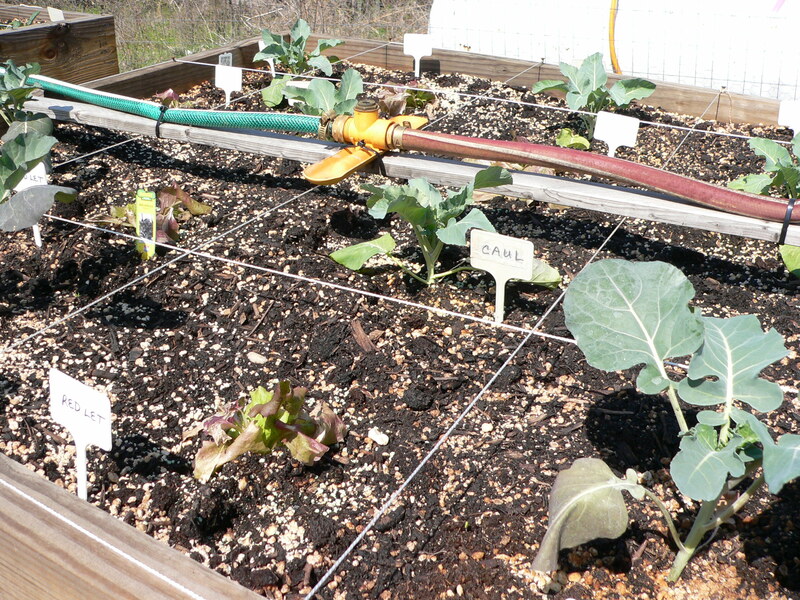 We also had a timer malfunction on the garden irrigation system, so the plants were really badly overwatered at one point before we figured out the problem and replaced the timer. Now I THINK we’re finished with the hard freezes. Our temperatures are still roller-coaster-y, though. 90 today. 60 tomorrow. 80 the following day…. 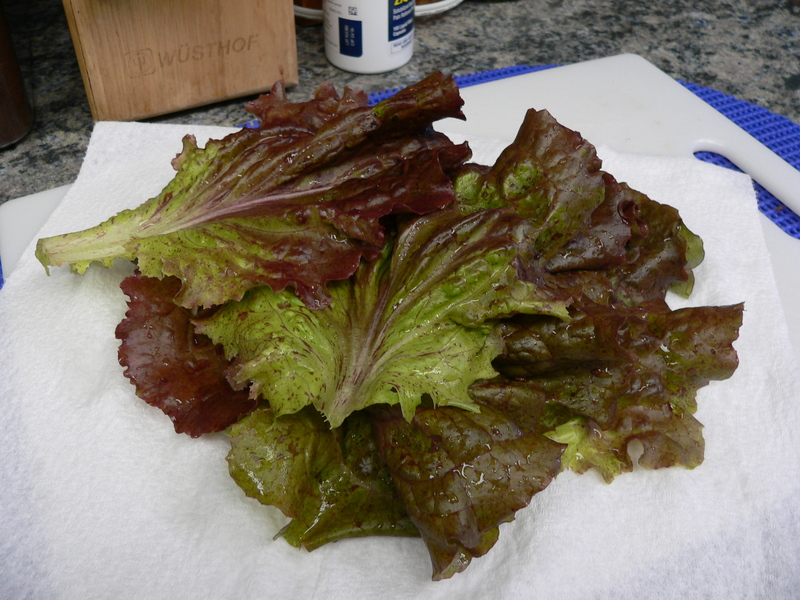 Here you see red lettuce leaves and spinach. 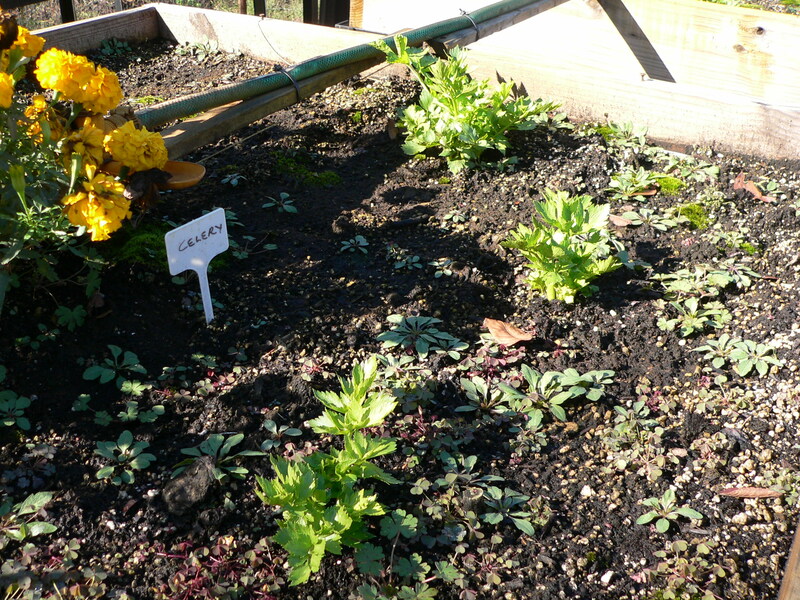 As you can see in this, and the next, pictures, some of the celery is doing well. Some has croaked. This is the south side of the garden. 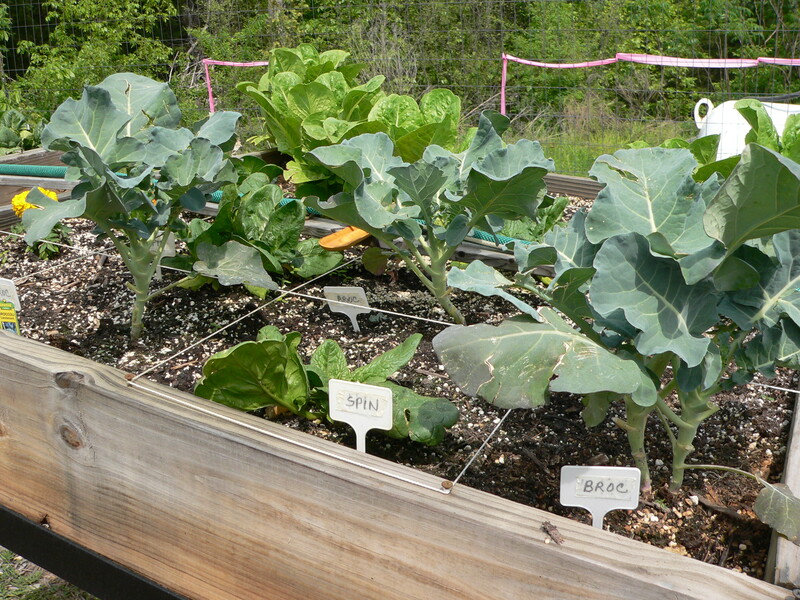 I’m growing Georgia Sweet Onions in the back, red lettuce and spinach in the middle, and broccoli, cauliflower, and celery in the box closest to you. 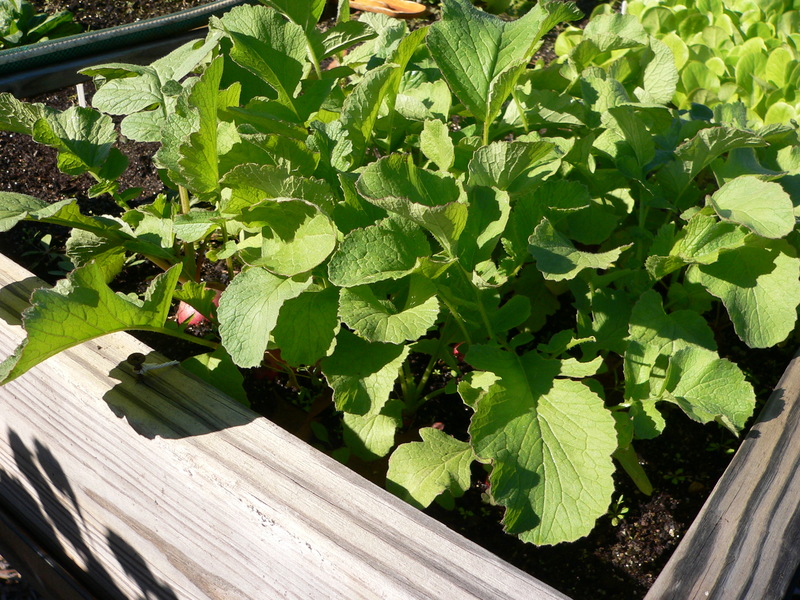 Romaine lettuce, spinach, broccoli, cauliflower, radishes, and red lettuce in the planters in the north row. Spinach sprouts on the window sill. 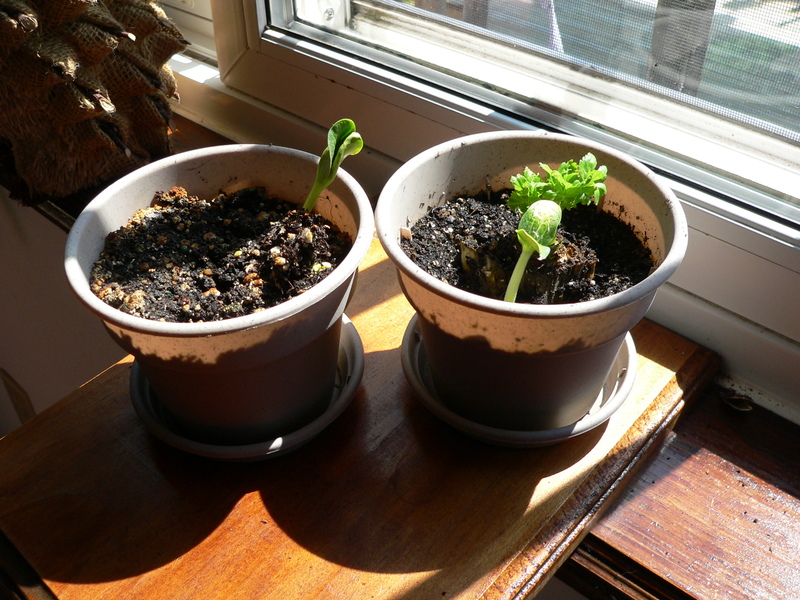 One celery plant and two spaghetti squash sprouts here. Hopefully, things will settle down now and my plants can grow in peace. 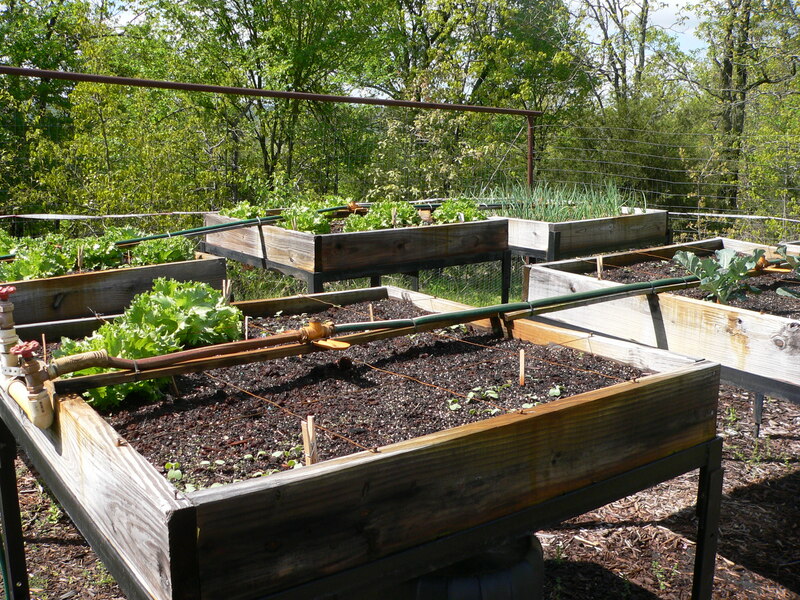 Here is one row of our garden. 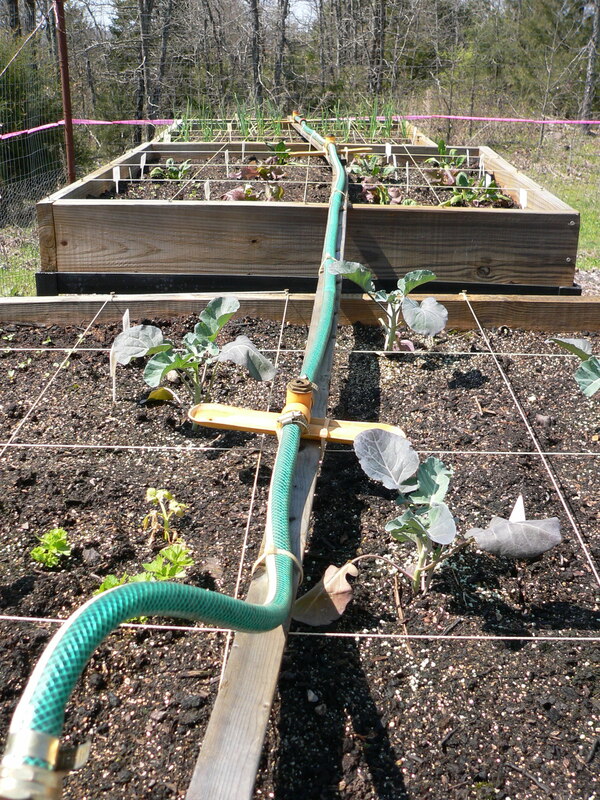 You can see three ‘boxes’ from front to back tied together by the irrigation system, which is on a timer we can control. Most of the garden is in now. 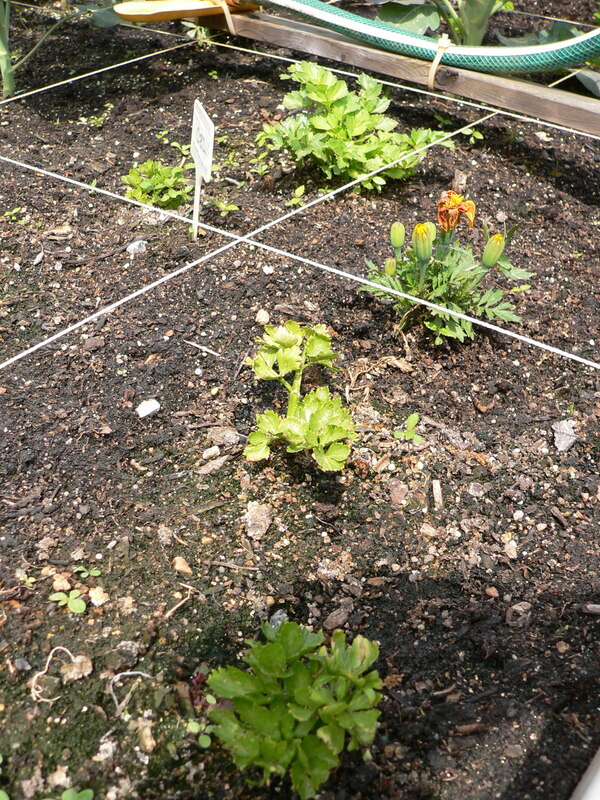 This is the second row of the garden with another three boxes. I just went over and hugged my husband again, thanking him (1) for the idea of our building a raised garden (when he saw how very hot, tired, and achy I got getting up and down, planting, weeding, and harvesting the garden on the ground), (2) for all the time and energy he spent building and installing the boxes, cutting and welding the support tables that hold up the wooden boxes, designing the irrigation system, (3) for encouraging me to spend what I needed to get – and keep – things going in the garden. 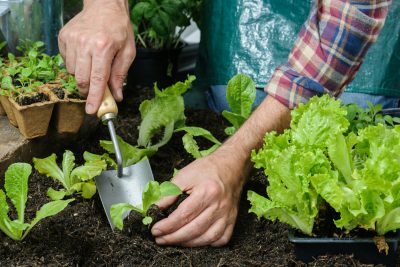 I visit the garden at least once a day – covering or uncovering the plants in protecting them from freezes, pulling the weeds that install themselves even up in the air, pulling off dead leaves on the plants, taking pics, and – the best part – when I can actually start harvesting what we’ve grown! 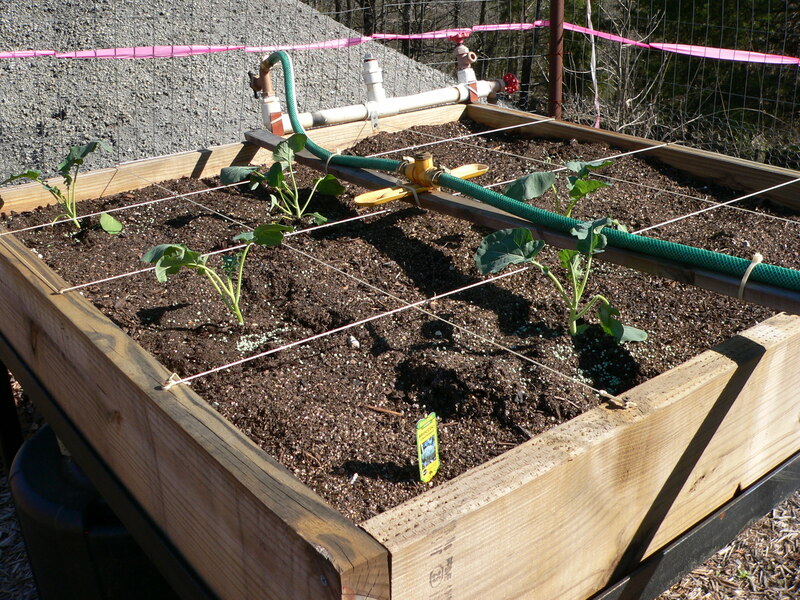 I’ve planted Georgia Sweet Onions, Broccoli, Cauliflower, Red Lettuce, Romaine Lettuce, Spinach, Radishes, celery, and spaghetti squash. 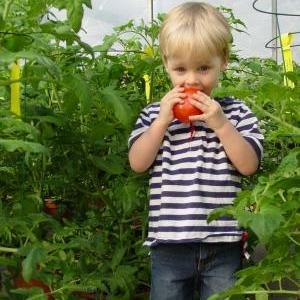 Probably next month, when the stores have a good selection, I’ll get three tomato plants. In another three weeks, I’ll get three more, making a total of six. 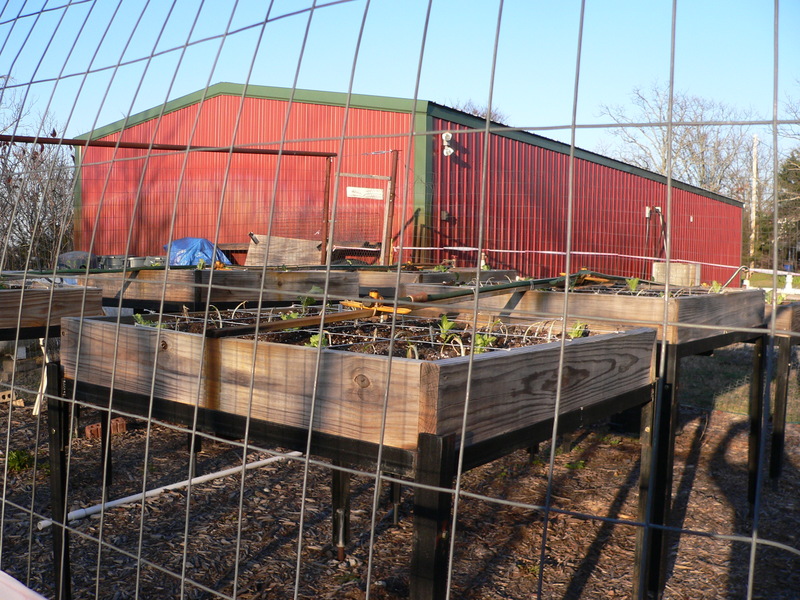 We have two brick planters on the east side of the house converted to square foot gardens, filled with Mel’s Mix, ready to receive the plants. 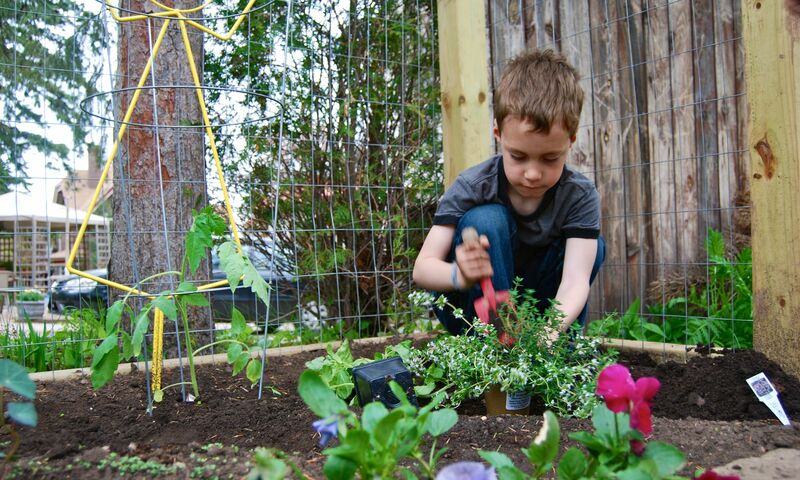 Our Garden is Officially Started! 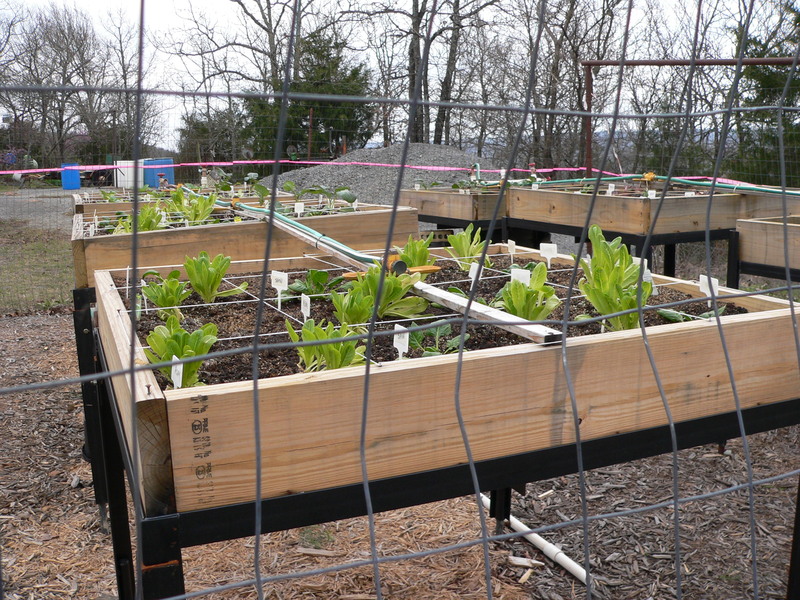 This is the first time we’ve had all six raised bed square foot garden boxes in our garden! 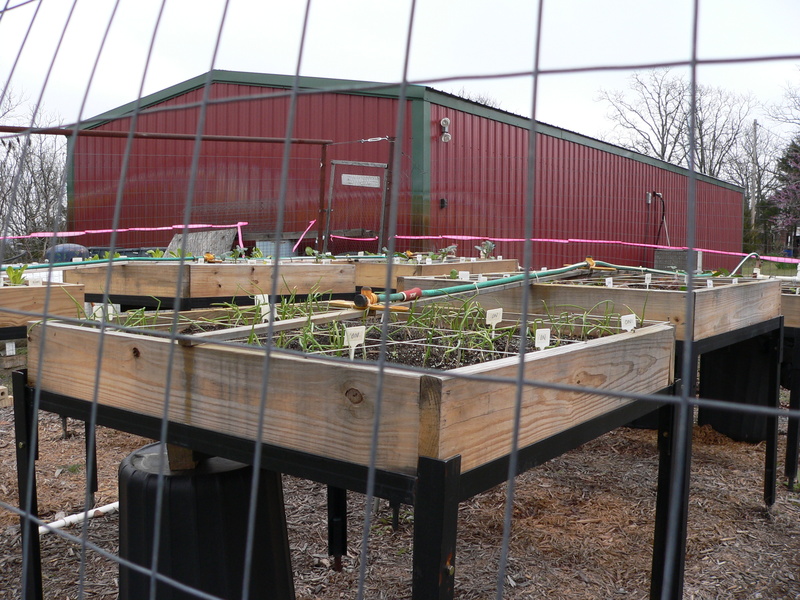 We have SIX 4′ x 4′ x 8″ boxes on legs connected by an irrigation system so that we can water everything on a timer. Each box has a sprinkler in the center. 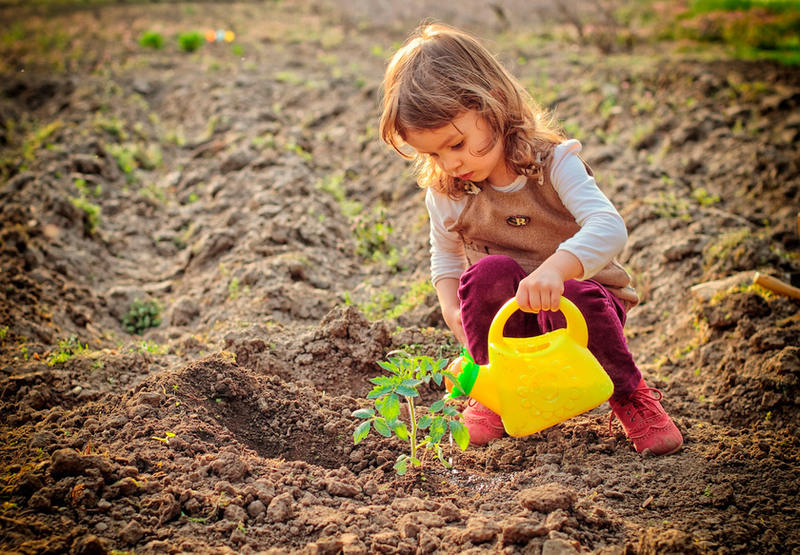 The timer is between the house and the garden, and we can either just turn it on to water manually, or use the timer so that all gets watered for a specific amount of time daily. 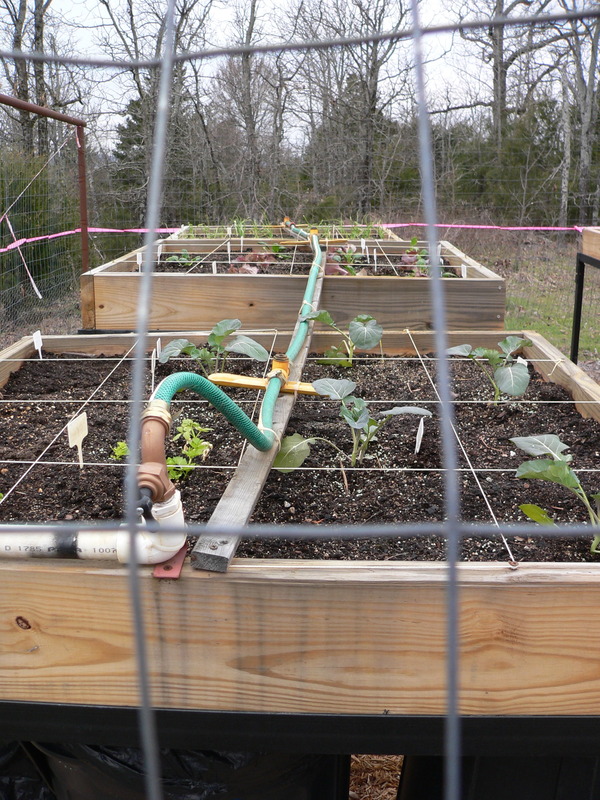 We have fencing plus chicken wire around the garden to keep critters out. 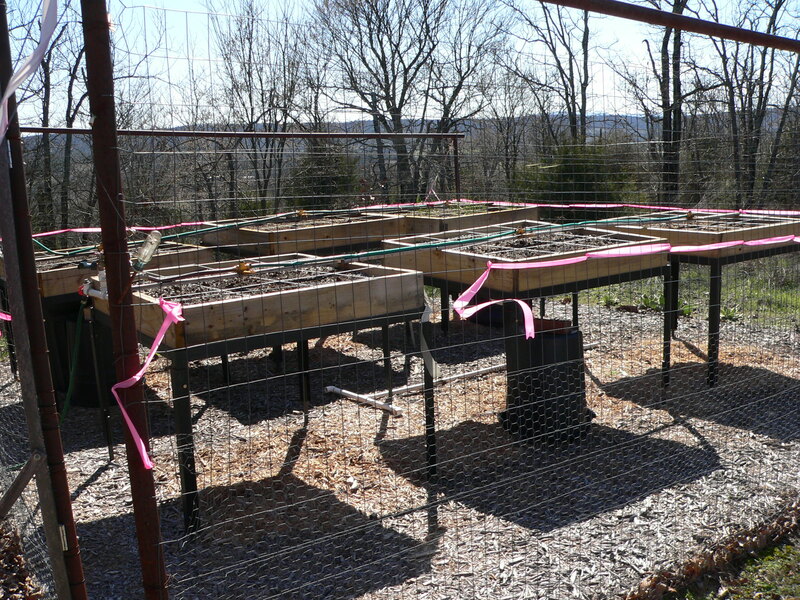 The pink tape is to keep deer from running into the fencing at night. We can put bird netting and shade fabric over the top of the garden, if needed. I found SPINACH plants! Hooray!!!!!!! 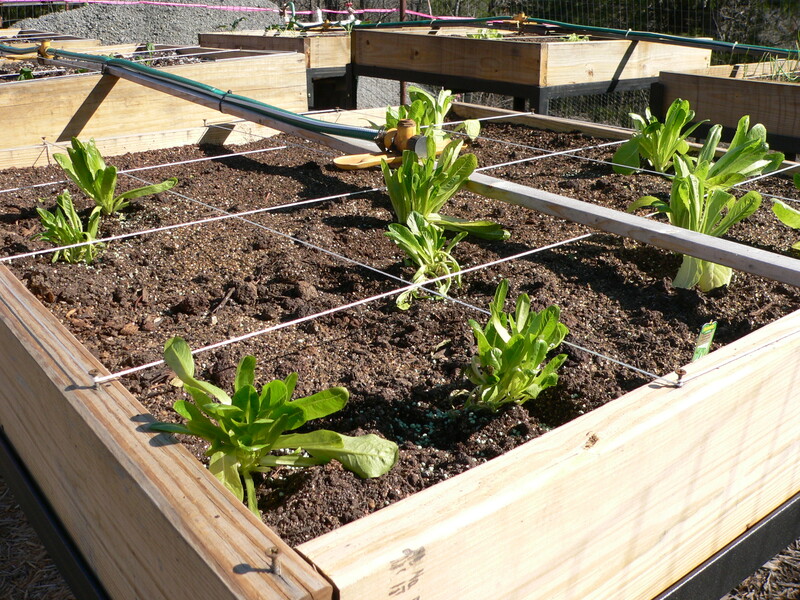 These are romaine lettuce plants. 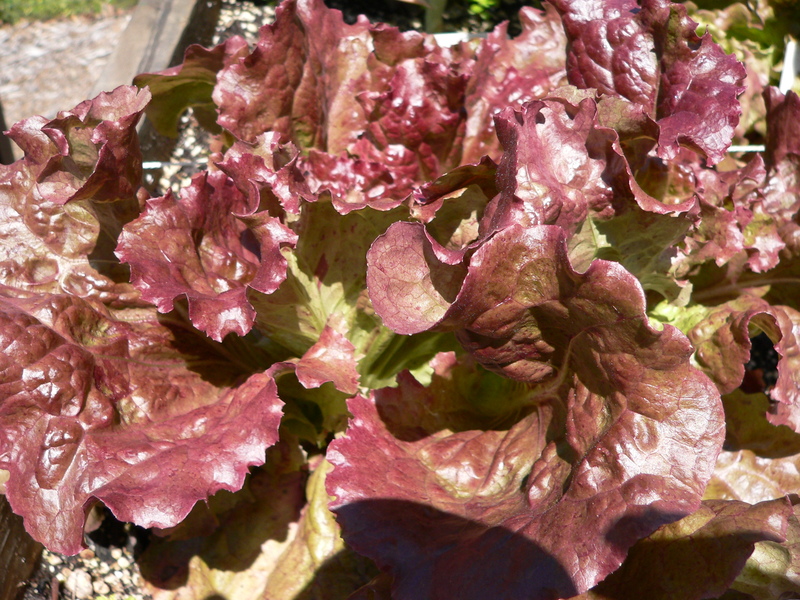 This is red leaf lettuce. I have moved some of my window sill plants to the back porch in preparation for moving them out to the garden. I have some celery plants and some spaghetti squash plants. My spinach seeds have tiny sprouts on the window sill now. I may have some more spaghetti squash plants. I’ll probably get more plants tomorrow. I want the local co-op guy to REALLY know how much I appreciate his getting spinach plants this year. 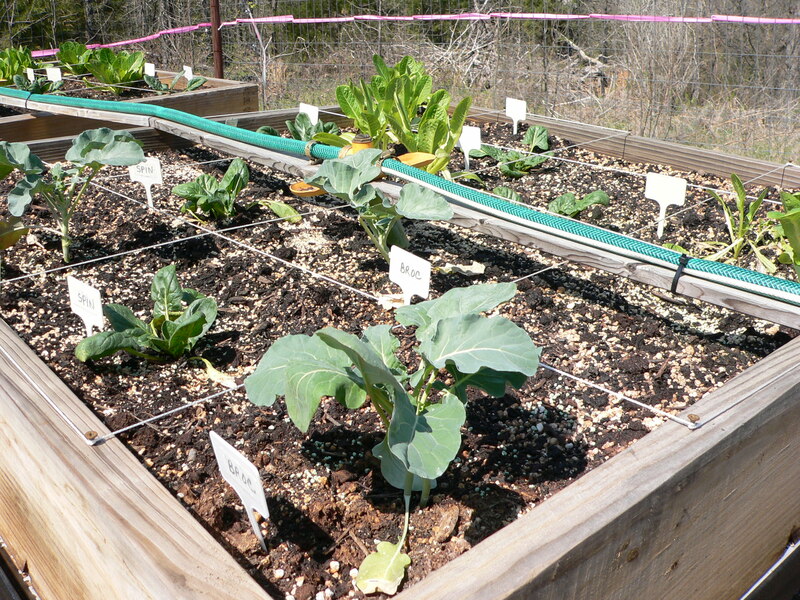 Tagged as broccoli, cauliflower, onions, raised bed square foot gardening, red leaf lettuce, Romaine lettuce, spinach, the spring garden is started! I told you that during a severe thunderstorm last week, one of our dining area windows we didn’t latch blew open, carrying half of my plants and other goodies off the window sill and onto the floor, all in a heap. I have re-potted what I could and planted more. 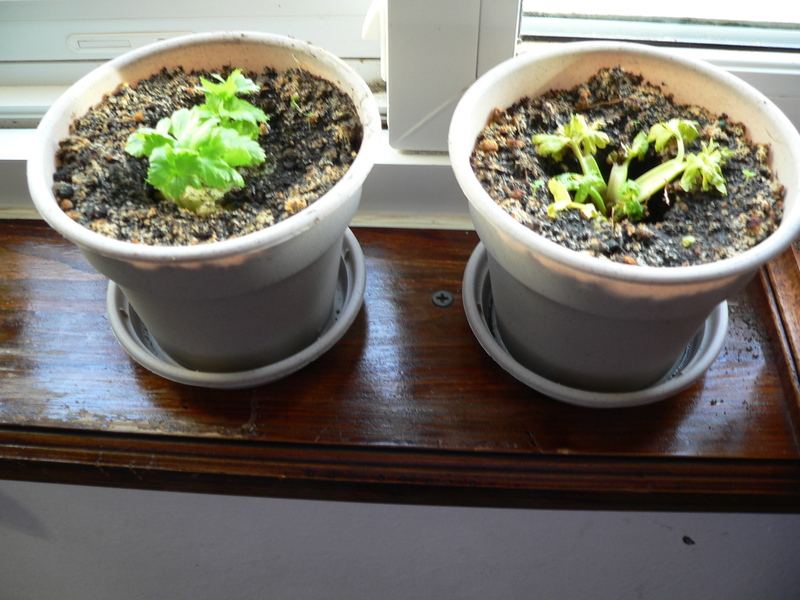 Two celery plants: the one on the left was undisturbed. I re-potted the one on the right with fingers crossed. 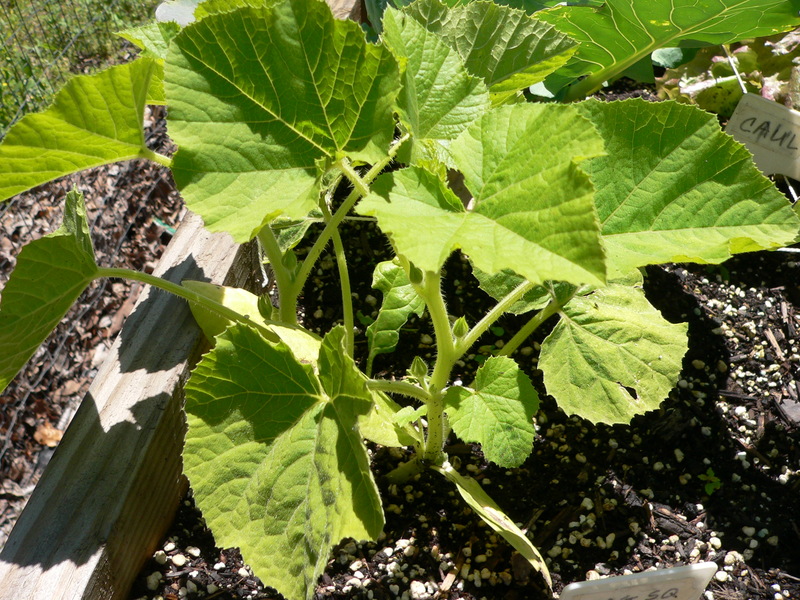 The large leafed plant is a spaghetti squash that was dashed to the floor. I think it MIGHT live! 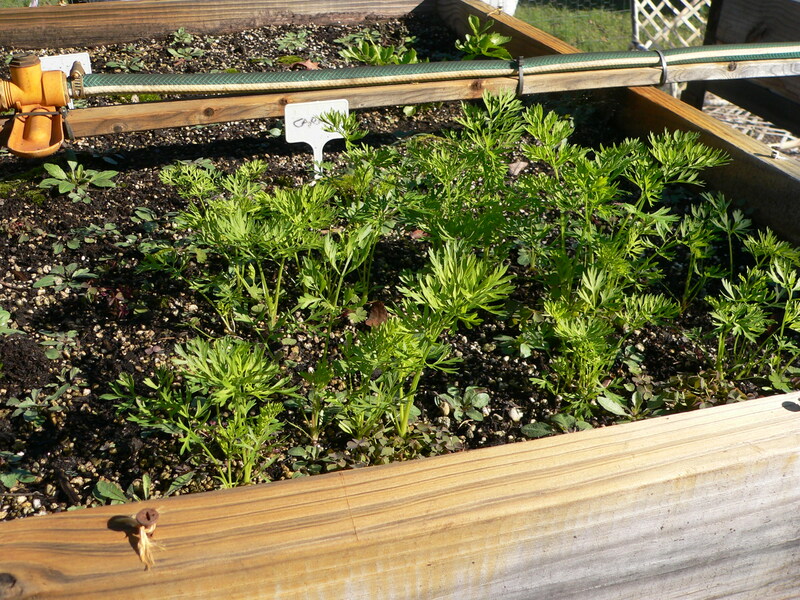 The other plants here are celery plants. 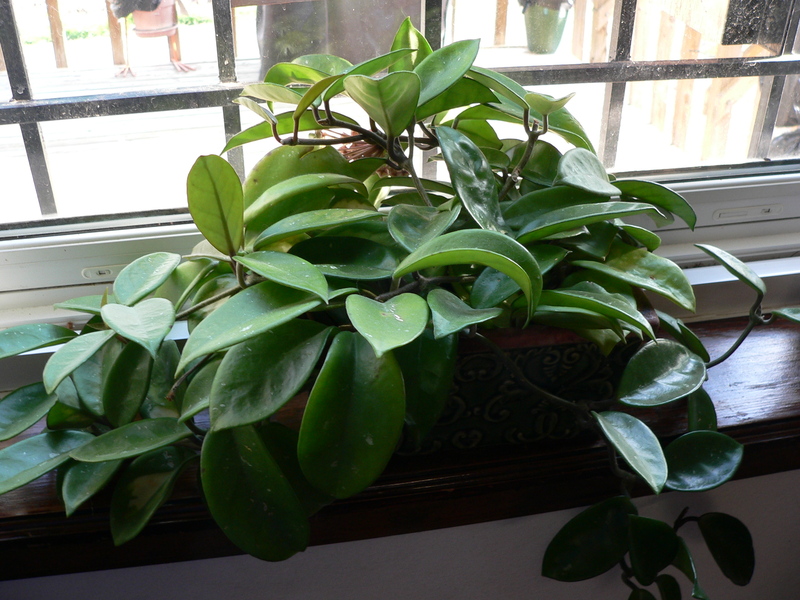 This is a long-lived plant that I started years ago. Happily, it was just to the left of the window that blew open. 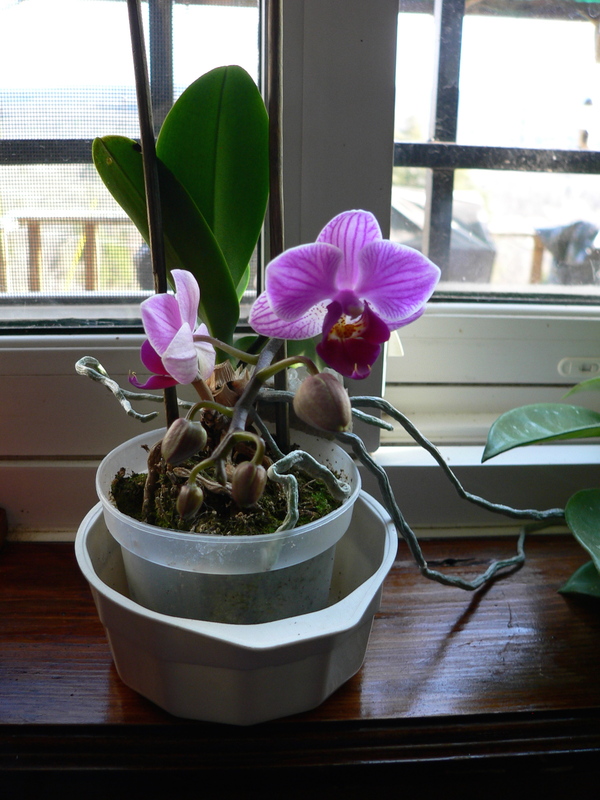 One of my dear friends gave me this orchid a couple of years ago. It was looking sad, and suddenly it had these two blooms! 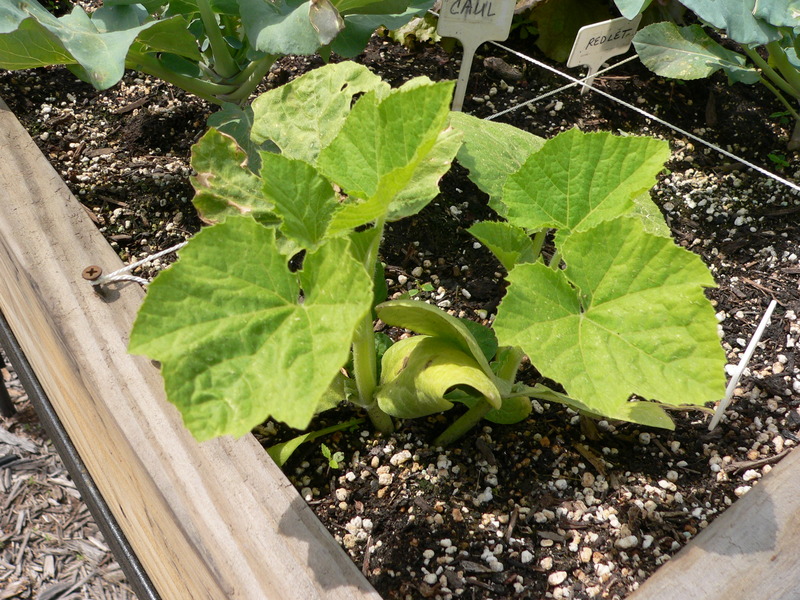 A newly started group of spaghetti squash. No action yet. 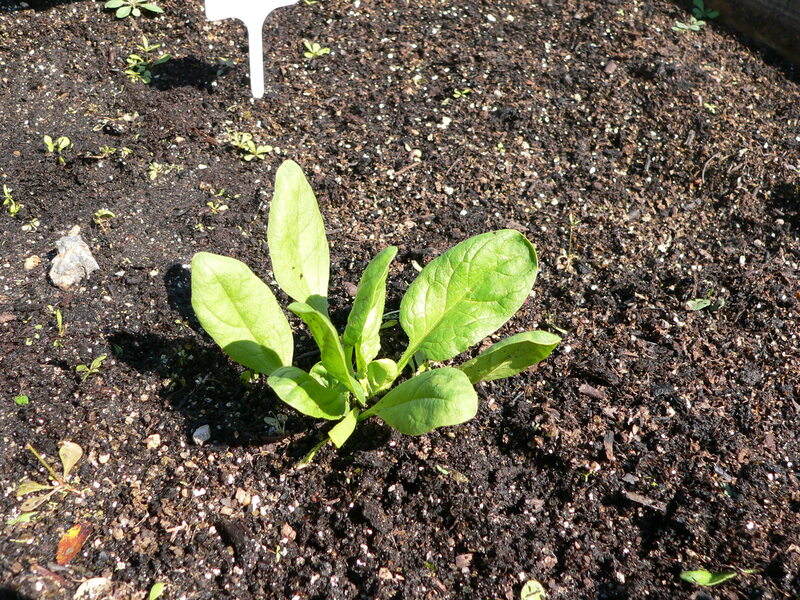 A newly planted bunch of spinach seeds. No action yet here, either. I’m hoping I can transfer some of these plants to the garden mid month. I’ve never had celery grow before, so I’m excited to see if I can actually do it. The spaghetti squash is an entirely new try, too. I saved the seeds from the squash I bought from the store. 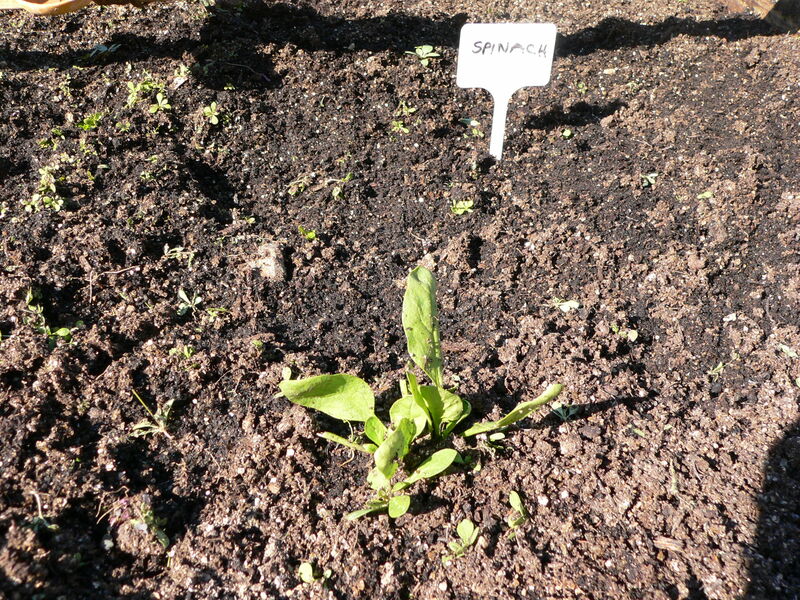 I haven’t found ANY spinach plants locally, so I’m especially eager for the new seeds to do well. I was really sad when the ones I had growing were thrown onto the floor. They were about 2 inches high. Fingers crossed!